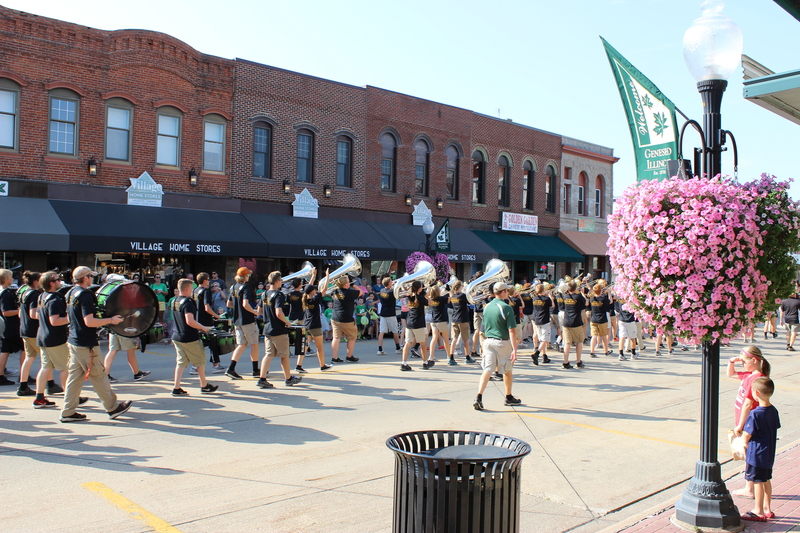 The goal of Geneseo’s Giving Trees is to see businesses partner up to create a tree design that can be auctioned off for proceeds to be given to a local charity. We have partnered up with a crew that we are pretty used to working with, Durian Builders. 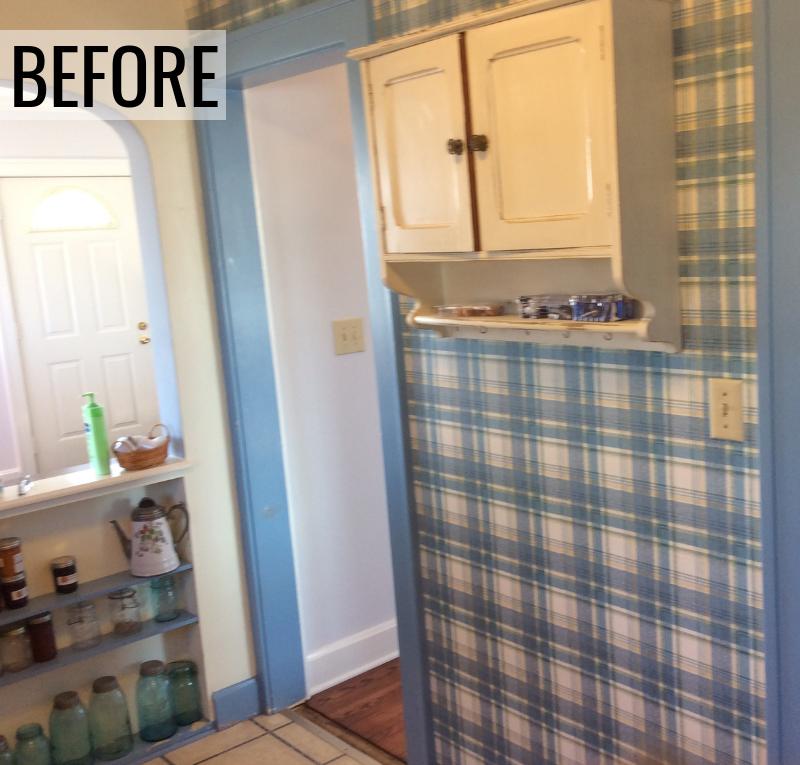 If you love seeing our before and after remodel stories that we share here on the blog and on our TV show, then you are familiar with their craftsmanship. 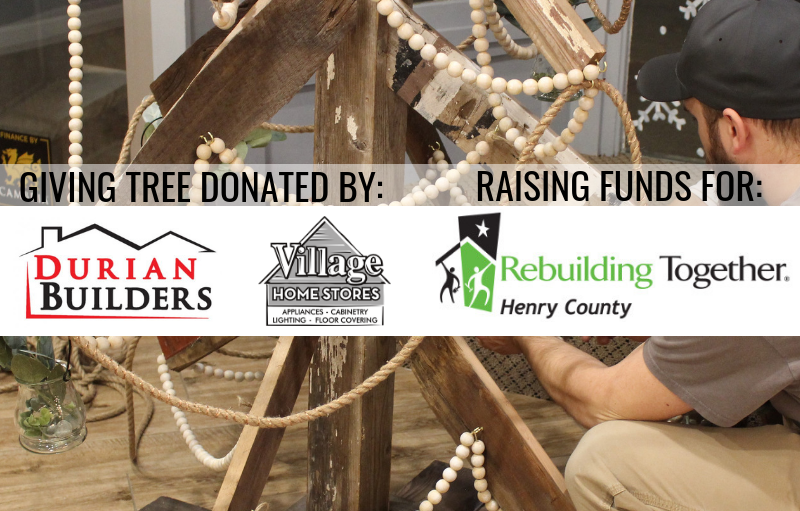 The partnership between Durian and Village Home Stores was a perfect match and we decided to choose Rebuilding Together Henry County as our charity. We knew we would make a great team but we never dreamed the tree would turn out this great! The team at Durian Builders decided instead of purchasing a tree… why not make a tree? Well, because that’s not that easy …right? It is if you are a skilled carpenter with vision. We searched all of Pinterest and Scott never found what he had as his own vision… so he sketched it up and went to work with his own idea. 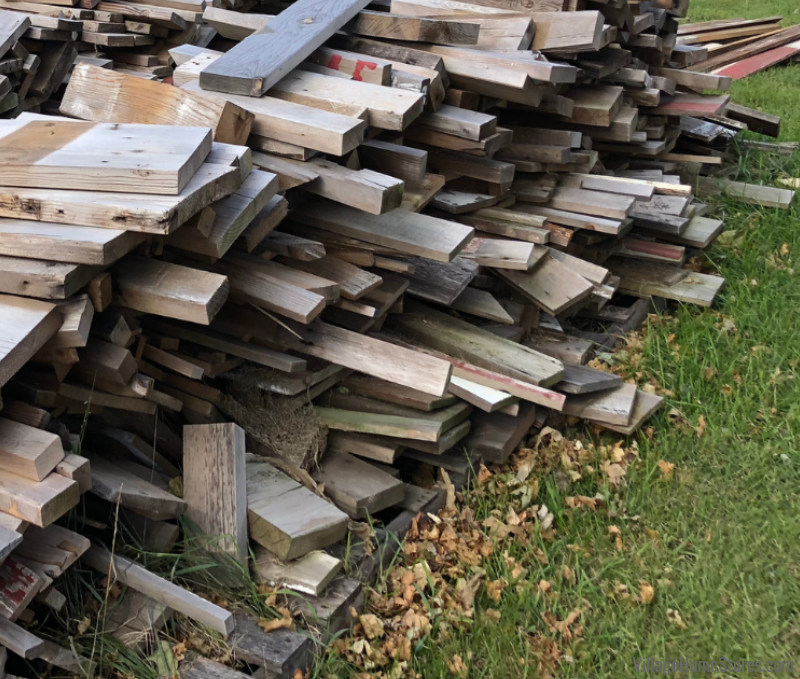 When he sent us an update that he had found the perfect stack of reclaimed barnwood to work with, we knew we were on the right track. From that pile of wood, Durian and friends built us a one-of-a-kind Christmas tree that we were certain could stand out as unique. But how to dress it without covering up all of that great character? We decided to take a trend that we have seen take off in Interior Design and Lighting and translate it into Christmas decor. 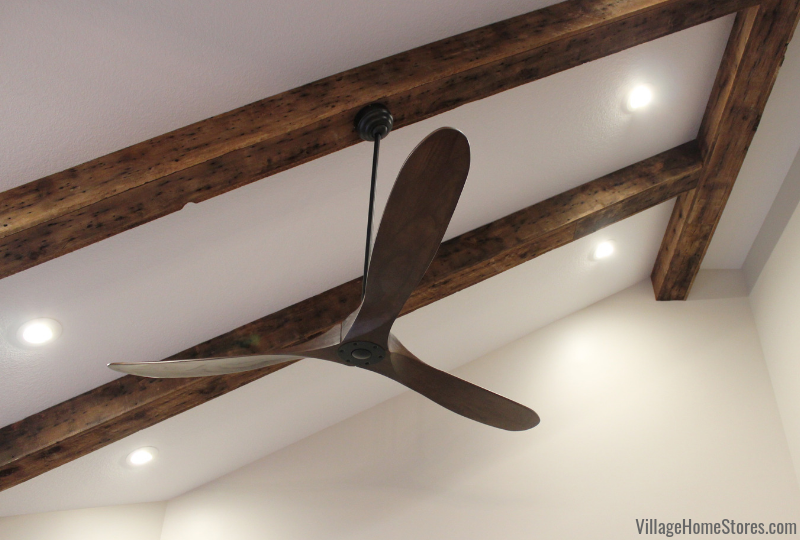 An Upscale, Weathered, Coastal style has branched off of the Farmhouse trend and we thought a Coastal vibe would be a perfect fit for weather barnwood. To light the tree we wrapped copper LED fairy lights around a thick jute rope. Of course no tree is a tree without some greenery on it. 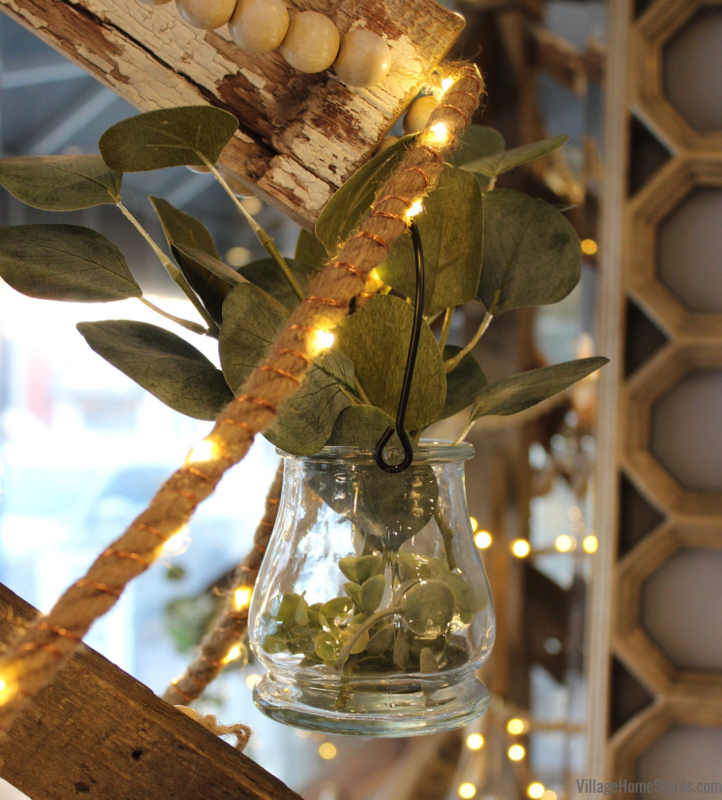 We kept our greens on trend by using varieties of faux Eucalyptus contained in transparent vessels. Small lanterns hang from five of the branches with small bouquets inside of them. The most talked about part of the decor are our DIY ornaments. We fully grant you permission to steal this idea! 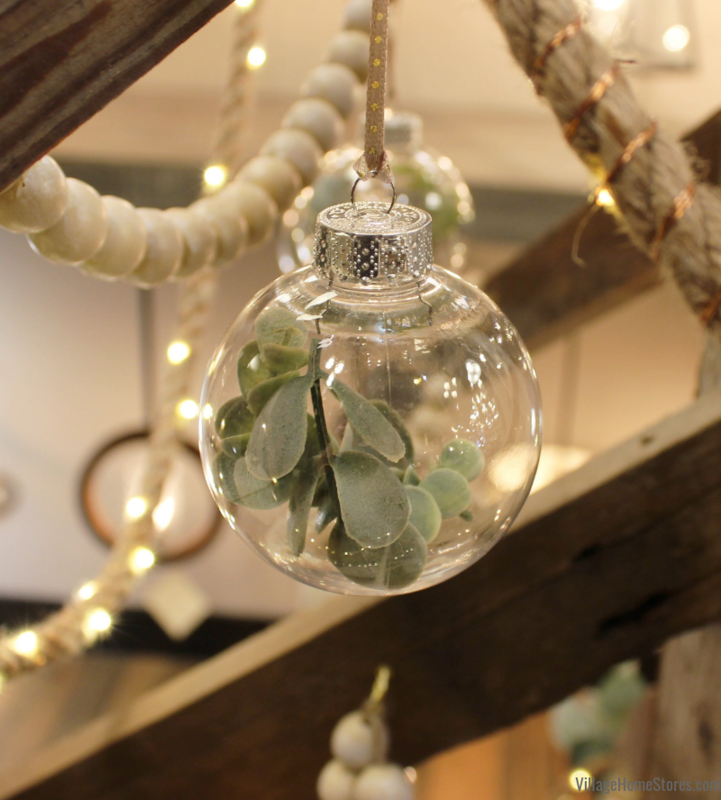 We took a large pile of shatterproof transparent Christmas Bulbs and filled them with sprigs of faux eucalyptus. This would be a super fun and safe DIY Christmas craft for a family to do together. We re-capped them and added a single simple loop ribbon and they are one of our favorite parts of the tree! Pin this and many more ideas to your own Pinterest boards by following our Holiday Decor board here. All of the ornaments hang from brass hooks applied to the tree branches. 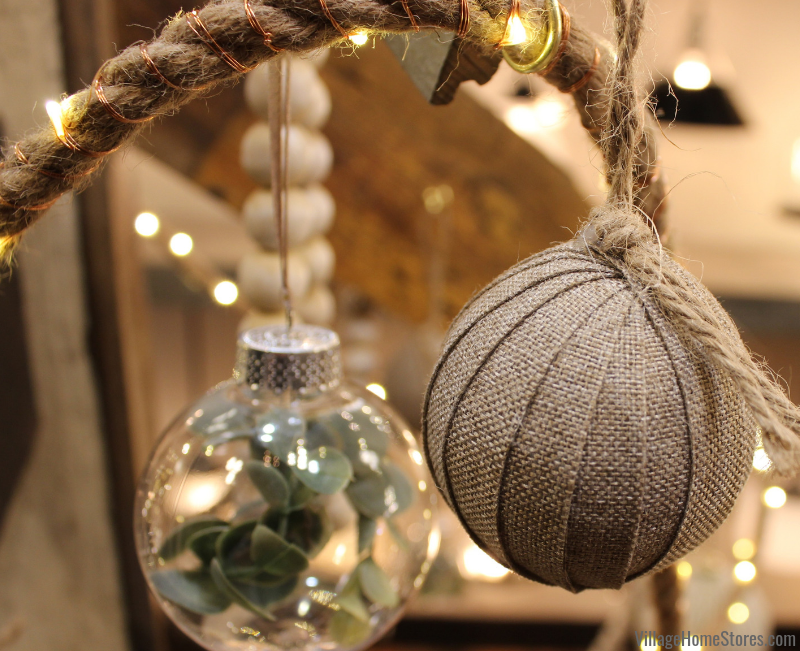 As an added stringed element to compliment the lighted rope, we made wooden bead swags. 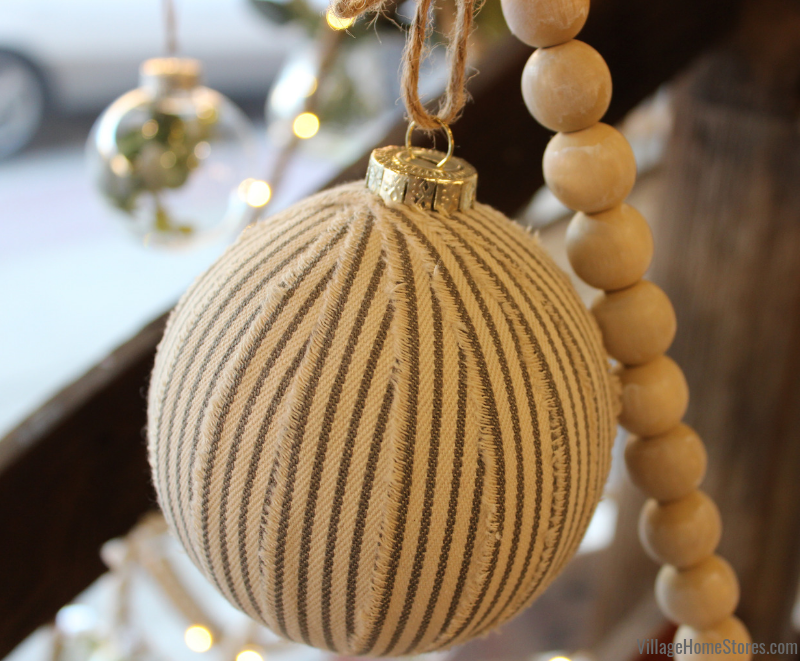 Medium-sized wooden beads strung on jute rope were painted with a white paint distressing finish and then given a subtle brushing of a pearled champagne wash for a little sparkle. 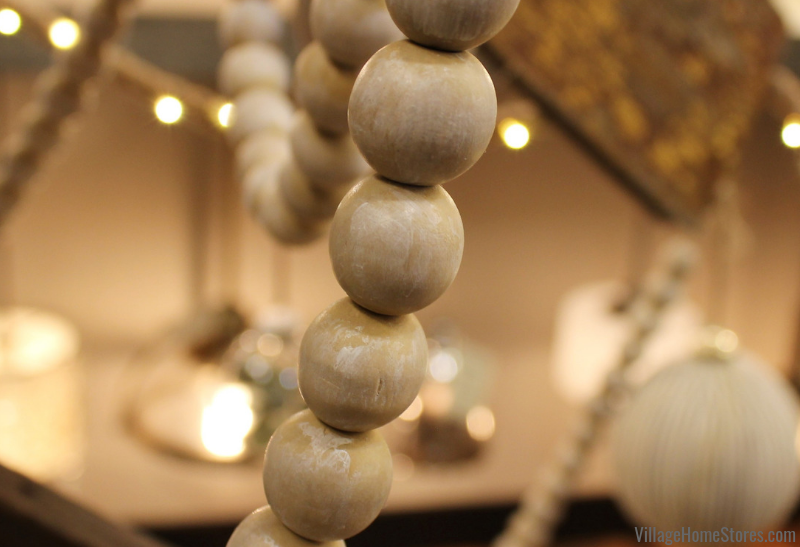 Weathered wooded beads are a huge trend right now in home lighting and you should see some of the fixtures we have on display in this category. 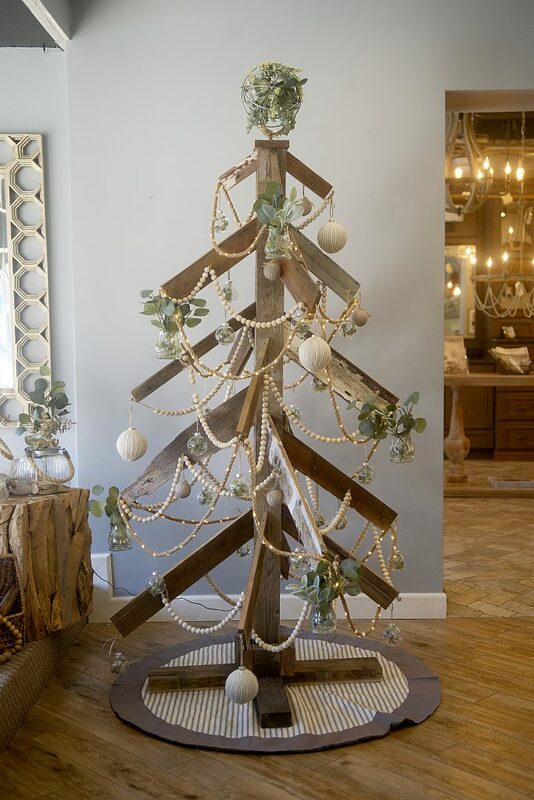 This tree was created with many neutral colors in mind so that it can be easily placed in any settings. You can always add your own punch of a favorite color or change elements of it year to year. Don’t you think you need this tree in your own home? You can have it! A bid sheet has been placed inside of our store window next to the tree. Opening bids begin Friday November 16th and bids may be placed in $25 increments. 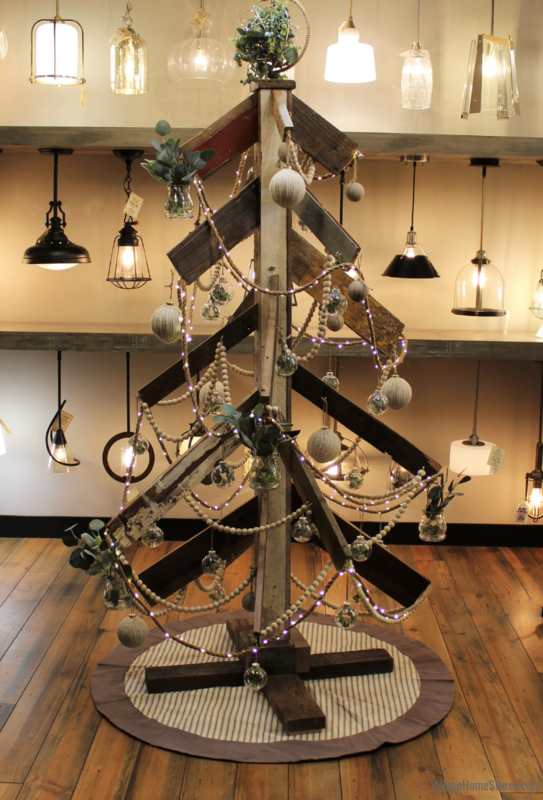 Our tree will be on display in the showroom window and available to bid on from November 16th through December 10th. If you just can’t wait until then to take your tree home, you can take part in the Buy Now option! Any time from November 16th through December 10th you can bid the full $1,000 retail value of our tree to “win” the auction instantly! This “Buy Now” option allows you to take the tree home at any time (even before the 10th). Wouldn’t she look lovely in your home or business? Stay updated on auction details and find information about all of Geneseo’s Giving Trees here on their Facebook page. To bid on our tree stop by anytime M-F from 9am-5pm or Saturdays from 9am-noon. You can call in your bids during business hours at (309) 944-1344 as well. Please note that a comment on any Facebook post or Instagram Post with an auction bid does not qualify as a bid. You must come enter a bid on the sheet or call it in. You can learn more about Rebuilding Together Henry County here on their website. If you would like to make a donation to them in the giving spirit of the holidays, we have a donations jar at our front desk. 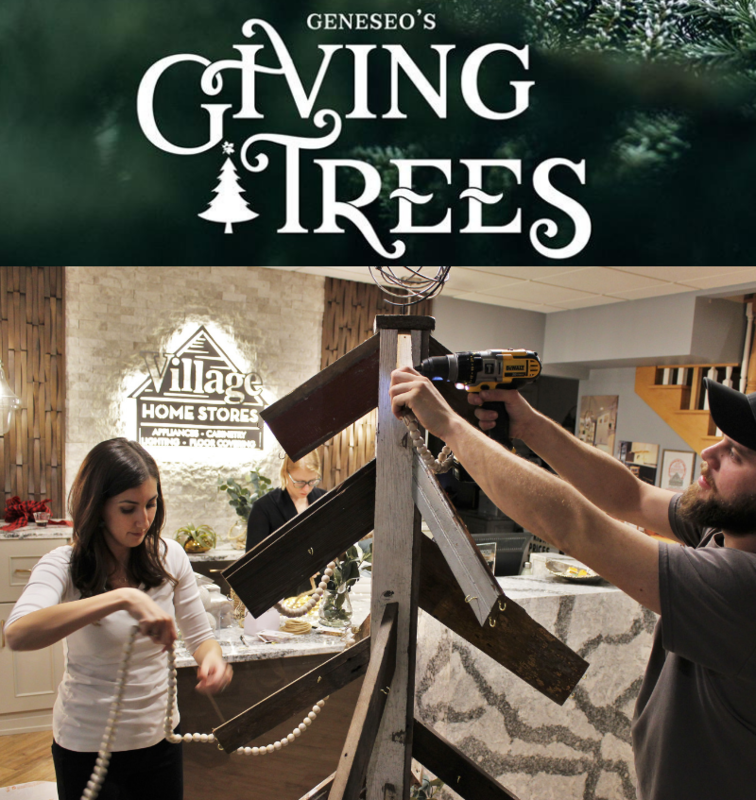 Learn more about Durian Builders here on their website and if you see any of their crew around town be sure to thank them for helping make our tree truly one-of-a-kind. Please stop by to see us this Holiday season and see it in person. Thank you so much to the Giving Trees committee for putting an idea into action and empowering so many small businesses with a way to give back this year. Just in time for harvest in the Midwest, this week’s remodel feature is a tailored and updated take on country charm. Who says having a house and some acreage means all the best things should happen outside? While the kitchen in this Geneseo, IL rural home boasts some incredible views outside the windows, the view is pretty great in here! 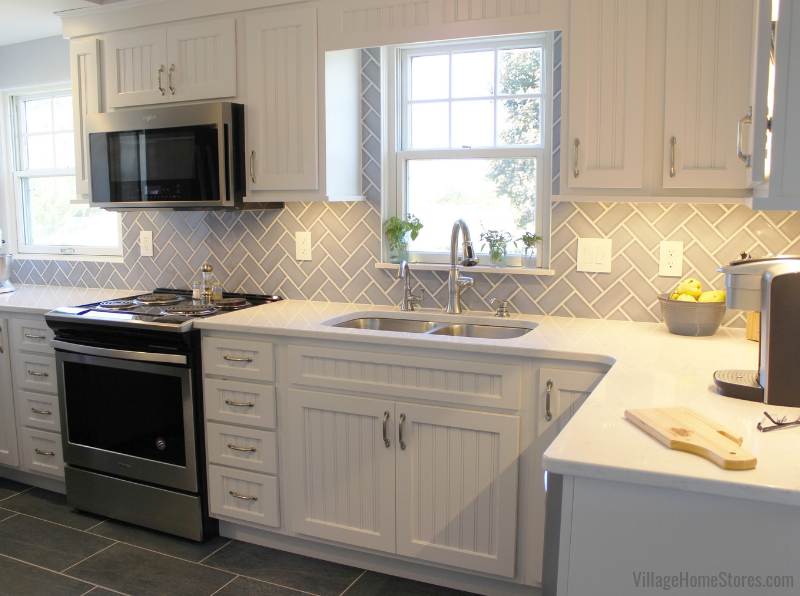 Take a look at this bright and cheerful new kitchen remodeled from start to finish by Village Home Stores. White painted cabinetry, marble-look tops, stainless appliances, and soft blue-gray finishes give a refreshing new look to the space. A kitchen layout with lots of new storage and counter space greets you from the back door as well as this (above) view in from a pass-through window to the Living Room. But even with these great windows, the kitchen wasn’t always this bright and storage-focused. Like many homes over the years, the kitchen had evolved into a need for more storage space and new locations for appliances. 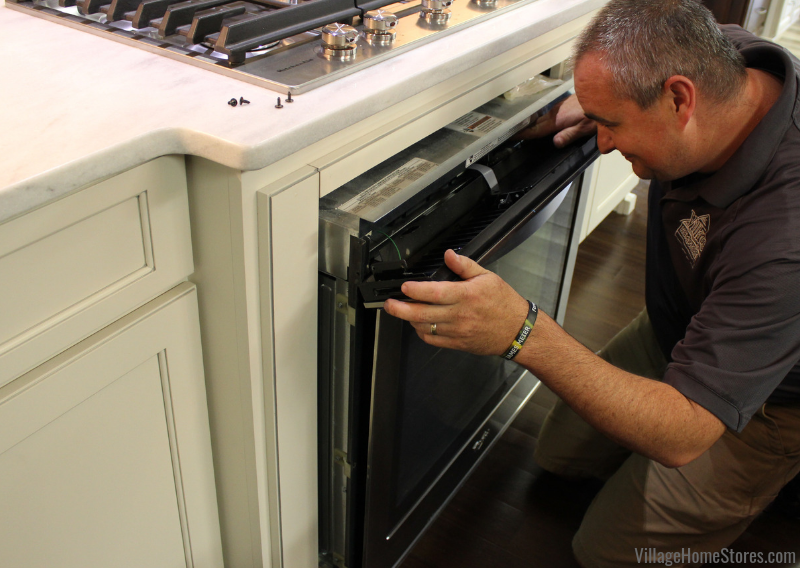 When working with a kitchen design expert at Village Home Stores you will help to qualify what layout and specialty cabinets will be the best way to utilize the space that you have available. In this kitchen we did not remove any walls or even soffits above. 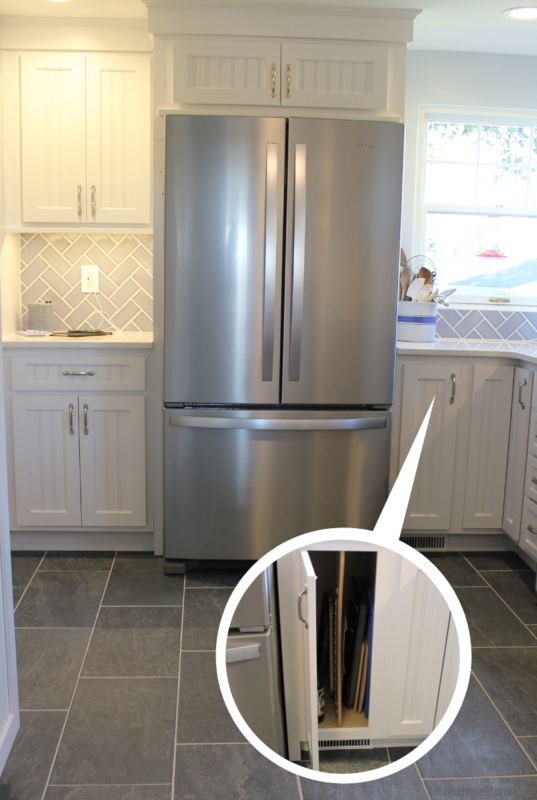 Instead, we accessed the locations of the major appliances and even found room for a dishwasher in the new design. 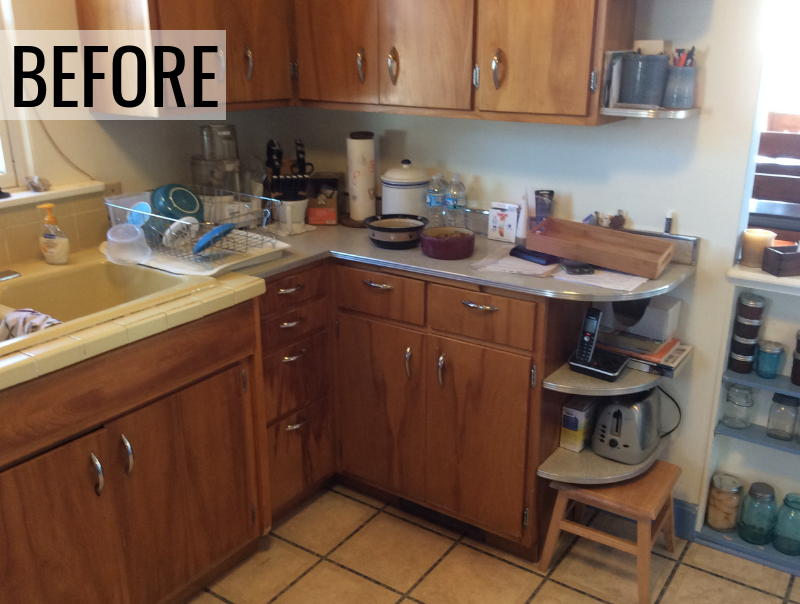 The before and after transformation of this corner gives you an idea of how a clean, consistent depth cabinet layout can keep so much stored out of sight and free up tons of counter space. The corner at the opposite end of the U-shaped kitchen was another area to be addressed. In the original space a small tiled landing zone was set up next to a crowded range area by the back door entry to the kitchen. That made the space feel cramped and crowded to the user at the cooktop. 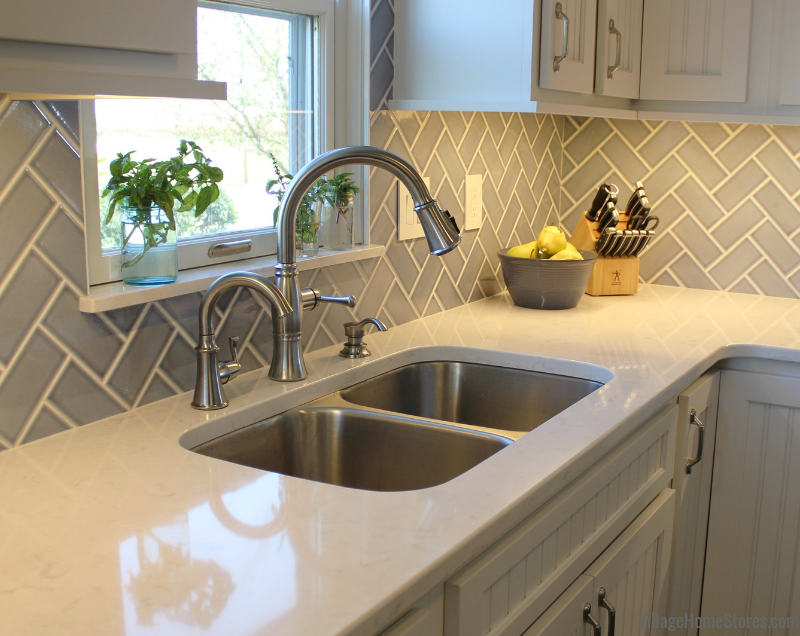 A tiled wall is great… but if you have ever had to keep a tiled countertop wiped clean you know it can be a constant struggle with the grout lines. There was also no storage in the base area of that corner. The new kitchen design creates a landing zone as a forward-facing drop zone area. A wall cabinet above and a standard base cabinet and drawer below plus a wall outlet from our legrand radiant collection that is fit with USB charging ports. 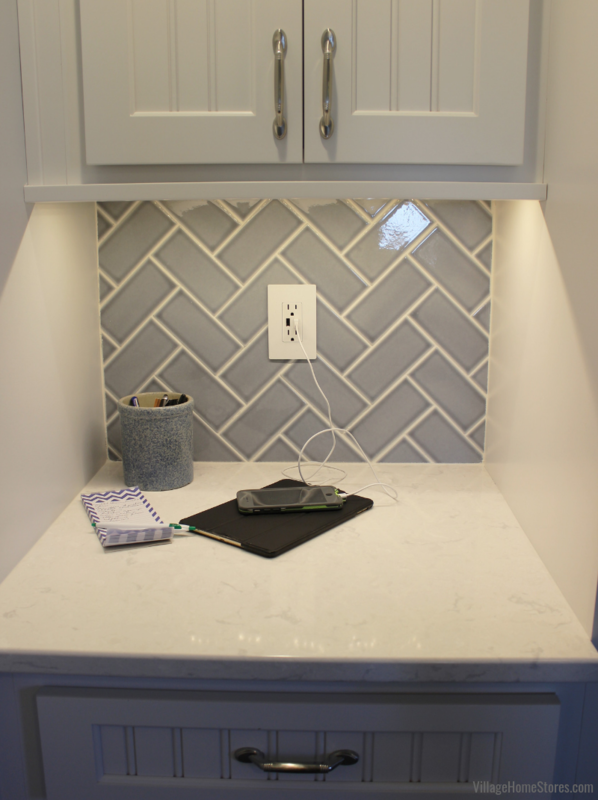 A strip of our diode LED tape lights illuminates the drop zone and new quartz countertops perfectly. This new kitchen features our Koch Classic Cabinetry line in a beaded doorstyle named Orleans that has been painted with a White finish. A painted white cabinet, light counters, and a whole new lighting plan makes the new kitchen very bright. 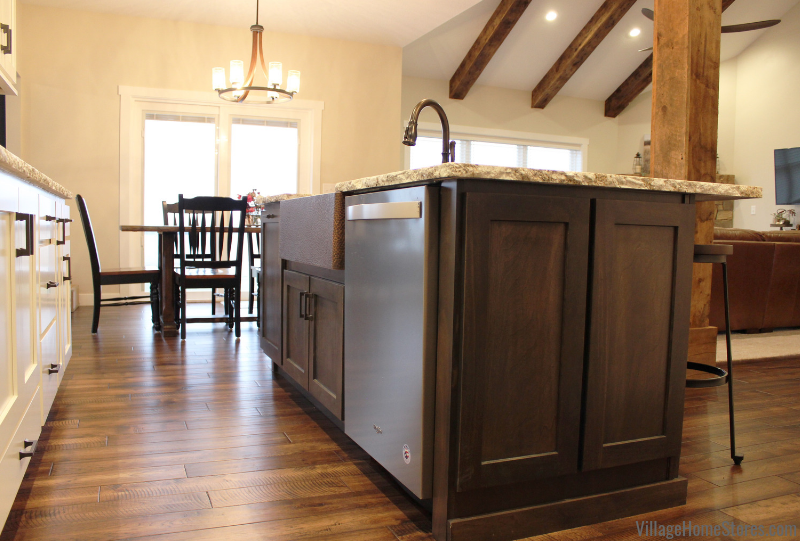 Press play below to see a 360 degree view of this Geneseo farmhouse kitchen and everything we fit into it. That’s a lot of storage and open counter space! Did you notice we even fit a tall pantry into the room? 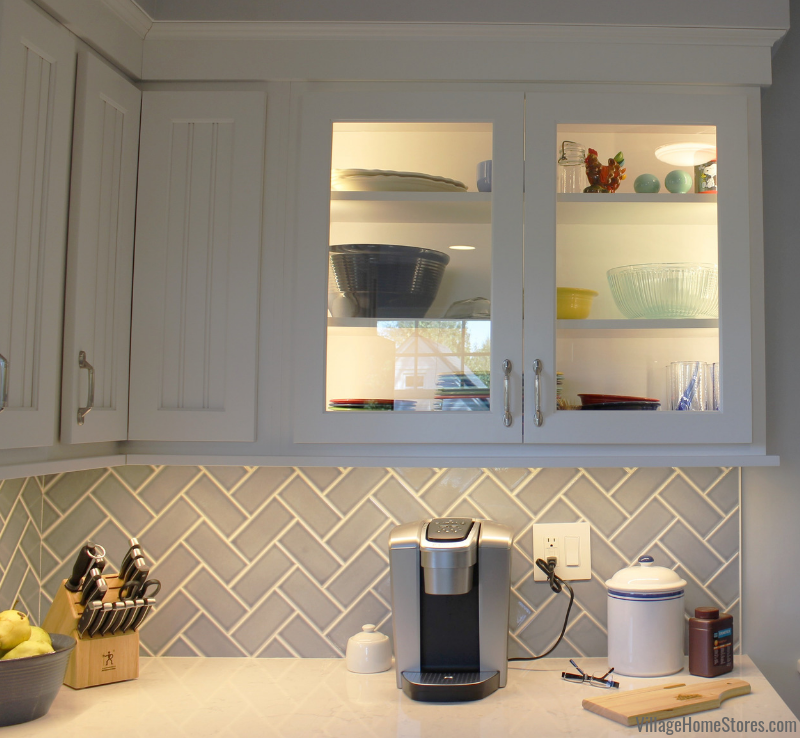 Pantry cabinets can be such a functional investment even if you can’t fit a 24″ deep one in. The original kitchen had a single wall cabinet and shelves set up below the pass-through window. The new kitchen now includes this tall pantry cabinet 12″ deep and 30″ wide. 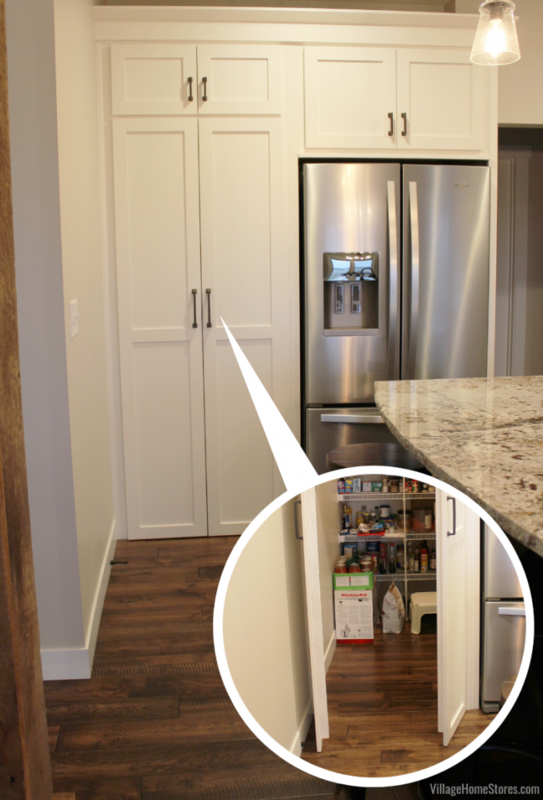 The top door section of the pantry has a finished interior and the doors have glass inserts for a display area. You would be so thrilled at the amount of storage a single cabinet like this can offer you. If you have an unused wall in your kitchen, nearby hallway, or even dining space it may be a great location for a shallow pantry. Crown molding on top gives it a finished look and the tall doors of this pantry are the best doors to showcase the beaded, cottage style center panels. 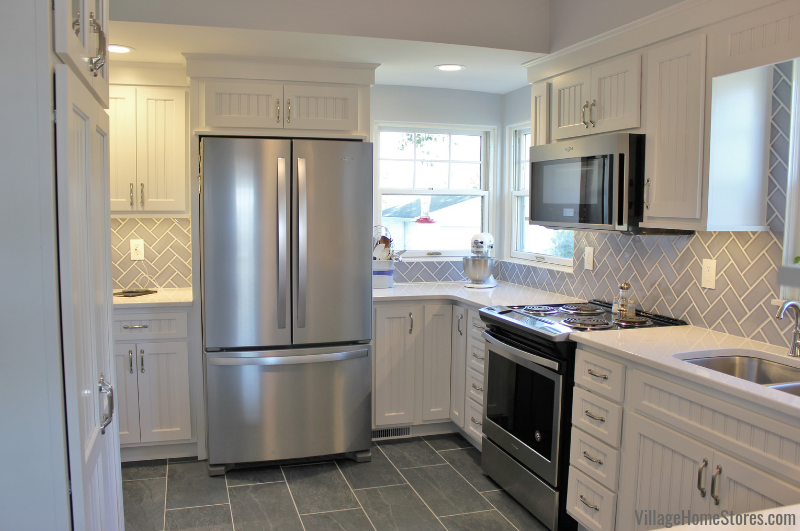 In the new layout, the range location has been swapped with the refrigerator for a more functional use of the kitchen space. You can see the drop zone mentioned previously to the left of the refrigerator. A narrow cabinet to the right designates an area for baking sheets and cutting boards in the new plan. A full depth model from Whirlpool was used because walkway distances were not an issue with no kitchen island in this plan. In fact, this full depth model has a total of 25 cu. ft. of storage space including gallon door bins and a full-width temperature controlled deli drawer. There is even an interior water dispenser inside the refrigerator. 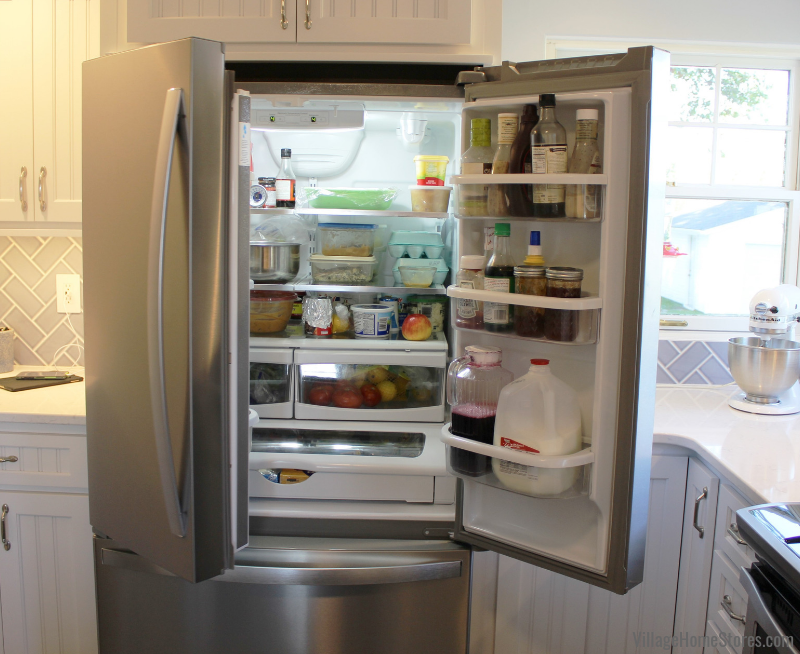 That keeps the front of the french door refrigerator smooth and stylish. 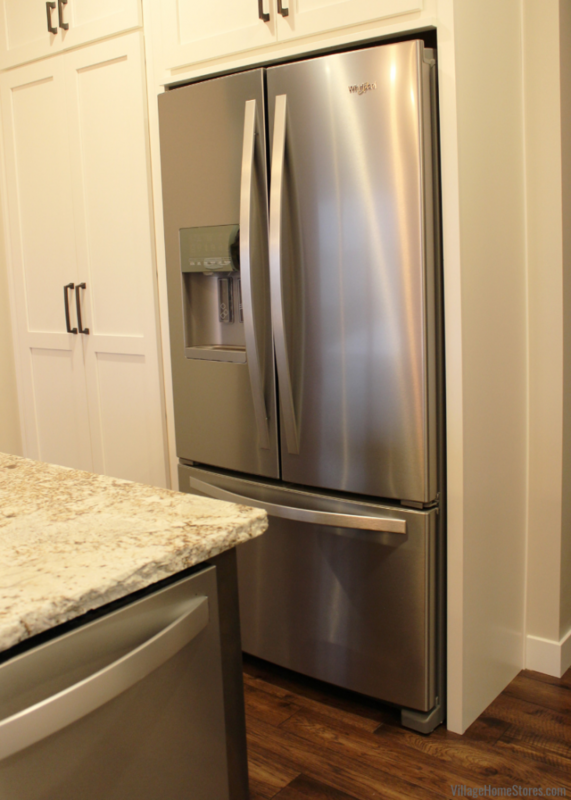 Oh and did we mention this Stainless finish by Whirlpool resists fingerprints and smudges and easily wipes clean?!?! The other appliances are pretty incredible in style and function as well. The new cooking zone of the kitchen is now located on the longest wall between the windows. Wall cabinets frame in a microwave hood also from Whirlpool. 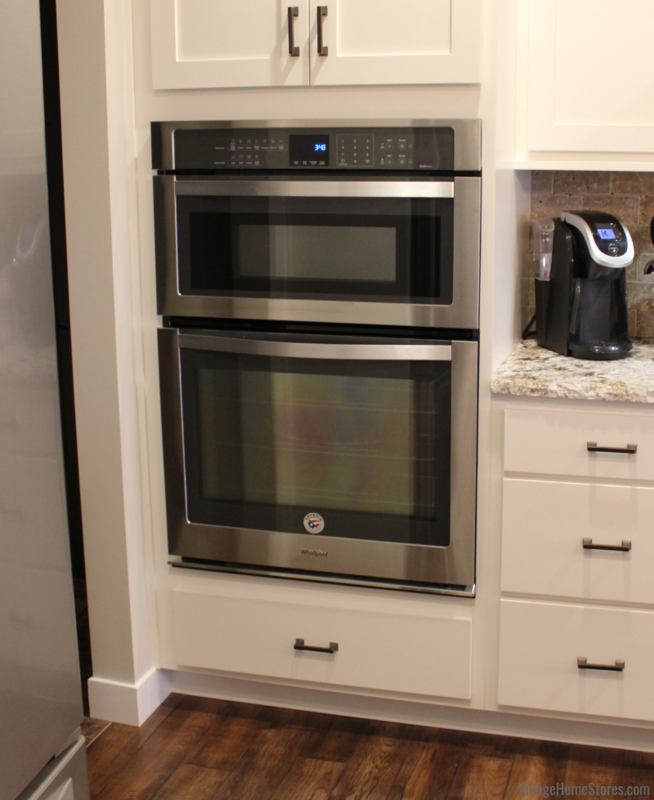 This amazing microwave model includes and Whirlpool’s innovative new Scan-to-Cook Technology. What is Scan-to-Cook Technology? Sounds like something out of the Jetsons right? Well with a connected Whirlpool appliance, it’s honestly is exactly as easy as scanning and then pressing start! These connected “smart” appliance features are available on many new Whirlpool appliances making them affordable AND keeping your kitchen activity simpler and easier. Press play below to learn more about the Scan-to-Cook feature available on select microwaves and ranges. A slide-in front-control electric range sits below with landing space on each side of it. This makes the cooking zone ideal for users during prep and cooking activity. So much space and just steps from pantry storage, fresh food storage in the refrigerator and the kitchen sink to the right. 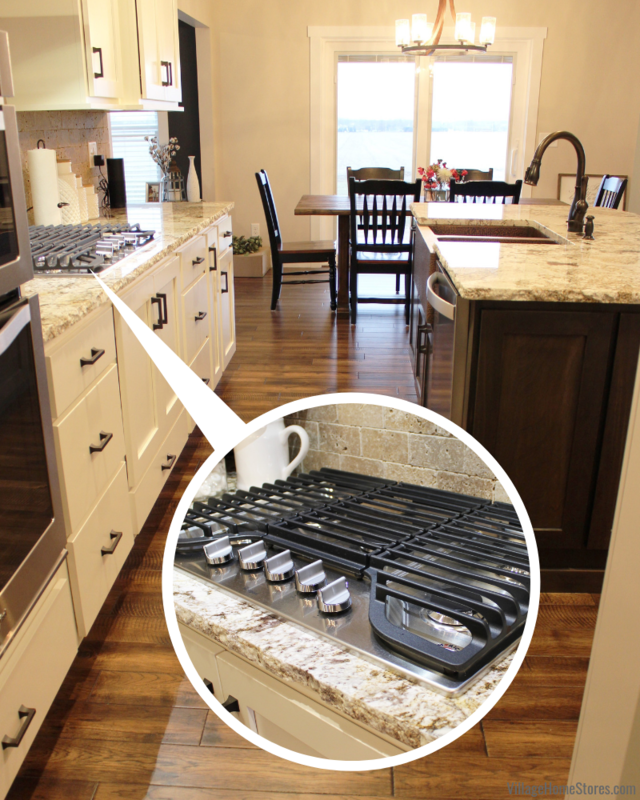 We love how these front-control range designs leave the back area where the cooktop meets the wall clear for tile. The light from all the kitchen windows pours in to surround the cooking zone in the new design. We admit we would get caught daydreaming out of this kitchen sink window about a million times a day if we lived here. 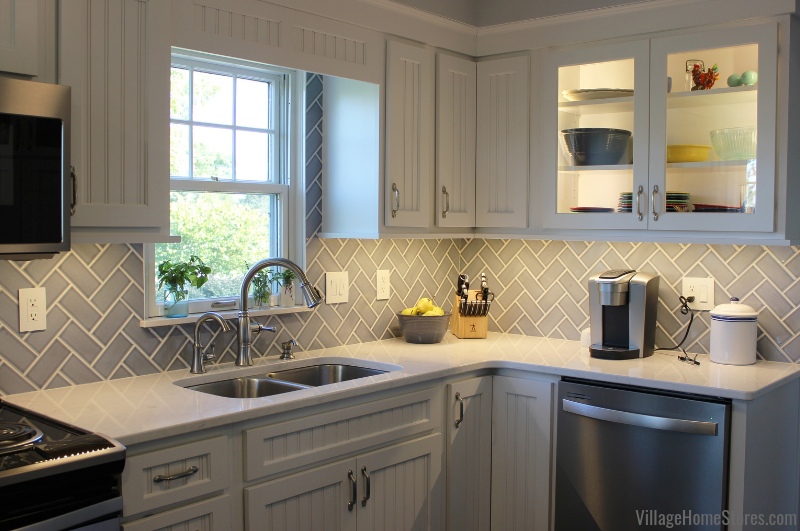 We love how the tiled backsplash carries up the wall to surround the window frame. A custom and charming detail. 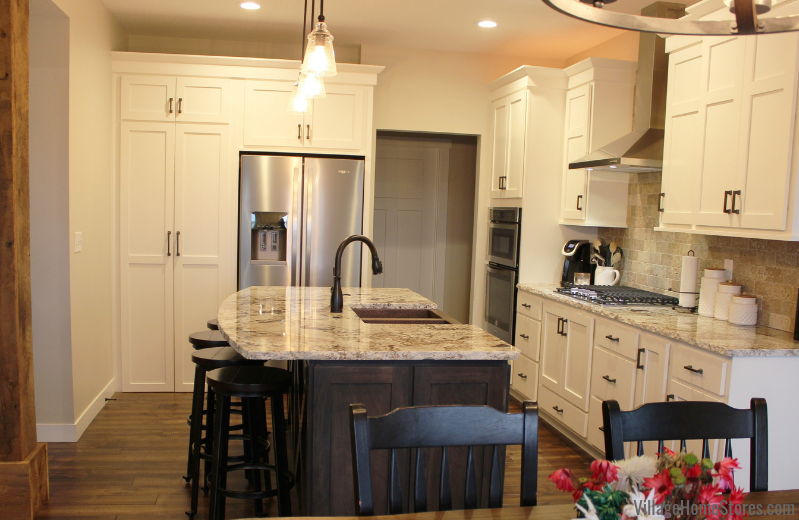 The marble-look countertops in this kitchen are the Swanbridge design by Cambria Quartz. 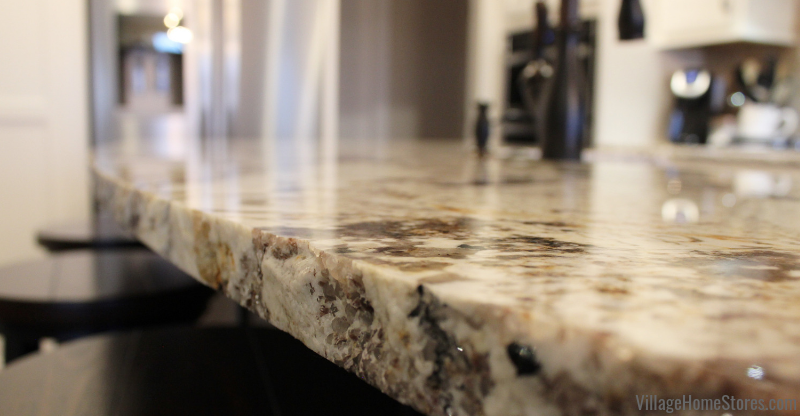 Manufactured in the USA, Cambria quartz is an ideal kitchen surface. It is foodsafe, stain and heat resistant and there are so many incredible designs to select from in both glossy and matte finishes. Learn more about Cambria Quartz and our recent visit to the Minnesota facilities here in a past blog post. 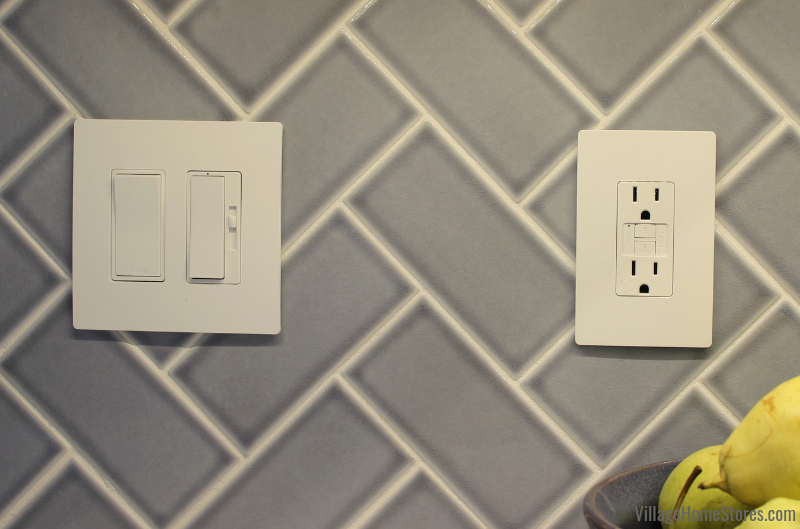 By sticking with a classic, a subtle countertop pattern, a more bold choice of wall tile could be used. The 3 x 6 subway tile from Glazzio’s Lumiere Series is amazing and the Eiffel Grey color has a faint cottage blue tint to it. Installing it in a herringbone pattern with contrasting grout lines is the perfect choice for a stylish statement. 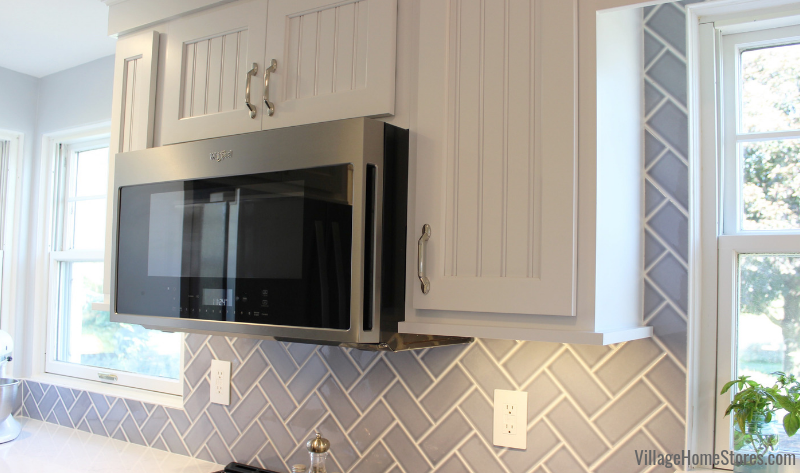 White switches and outlets from our legrand Radiant collection keep the backsplash area looking great (and notice no visible screws). Of course you know we can’t feature a great tiled kitchen wall without pointing out that our bestselling Diode LED tape lighting is why it looks so great! There is no better investment to insure you love your new kitchen day and night for many years than this lighting system. Every customer who installs it is shocked t how much they love it. Plus it is low-voltage and dimmable so you can leave it one a lot without high energy use. We even installed it inside the section of wall cabinets shown below. What a stunning look and what a transformation! 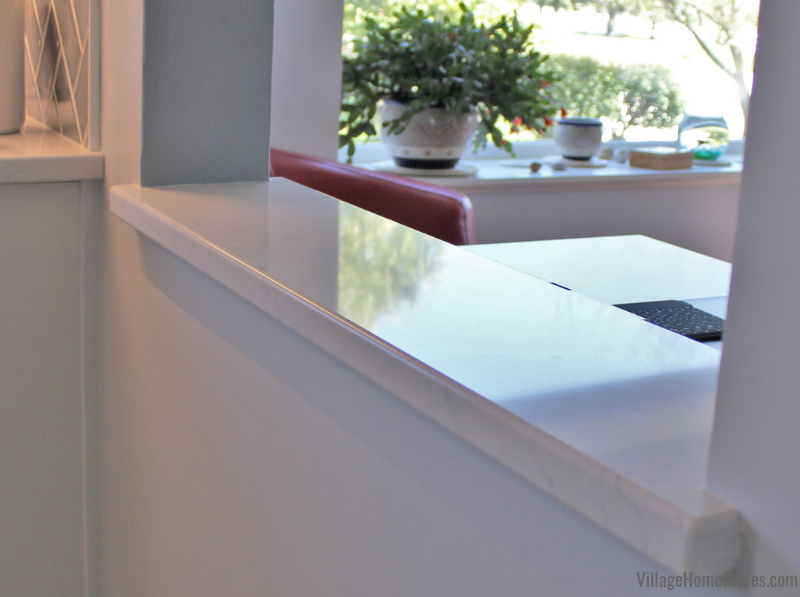 We added a ledge piece of Cambria Swanbridge quartz to act as a “sill” for this pass-through window. 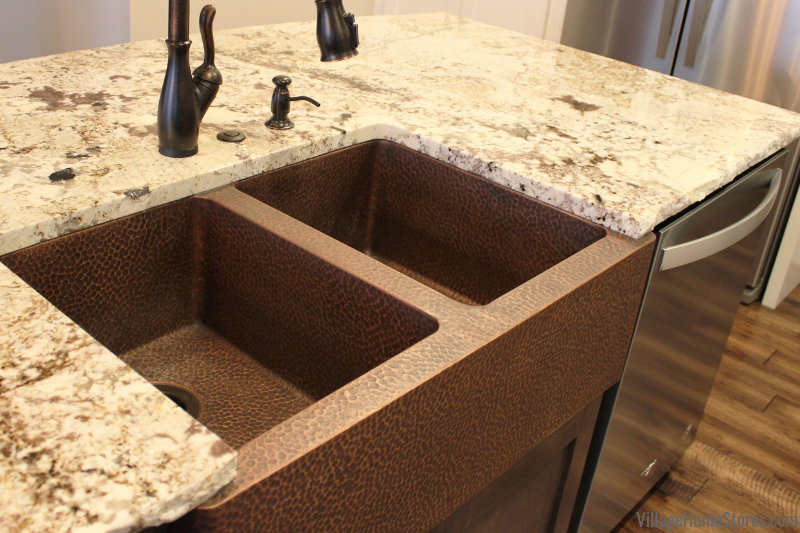 Repeating the countertop product in a new use helps to bridge the two spaces together. Ready for anything, this durable product is a great choice. The view above is looking fro the Living Room into the new finished kitchen. We love how the view looking in is framed up so perfectly by this pass-through window. Such an inviting space! Want to see more of this kitchen? The full album of photos can be found here over on our award-winning Houzz page. There you can save our ideas into your own ideabooks so you can show your designer at Village Home Stores what you would like to try with your own design. 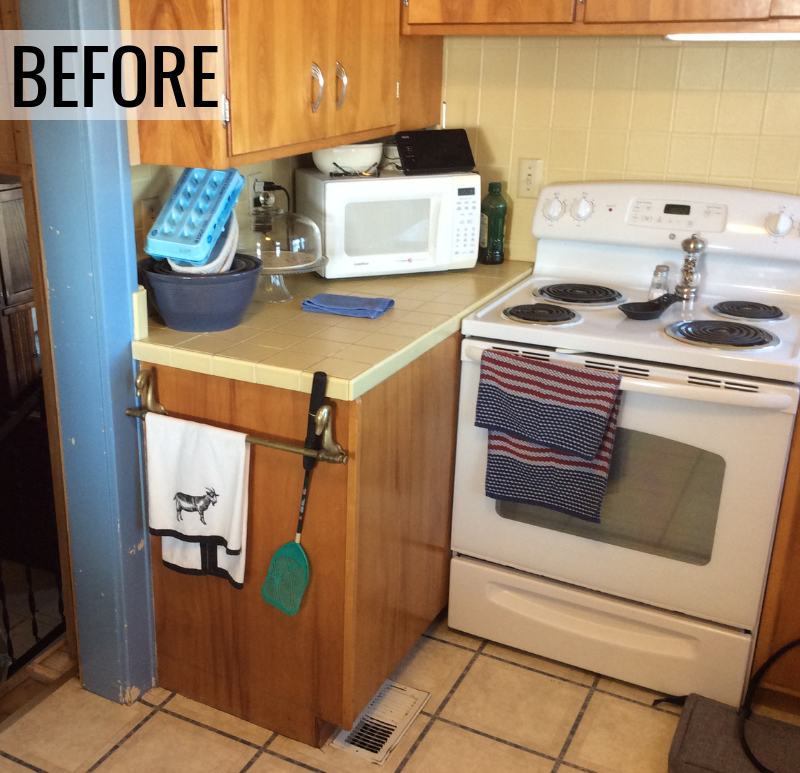 Ready to start the conversation about your own kitchen before and after transformation? Village Home Stores can help as little or as much as you need. Your first step is to reach out to our team. You can stop by our showroom at 105 S State Street in Geneseo, IL Monday-Fridays from 9am to 5pm or on Saturdays from 9am to noon. For your best experience, we recommend making an appointment. You can do this by calling ahead at (309) 944-1344 or completing the short online form found here on our website. We can’t wait to hear what you are working on. Who is Village Home Stores? Hello there! 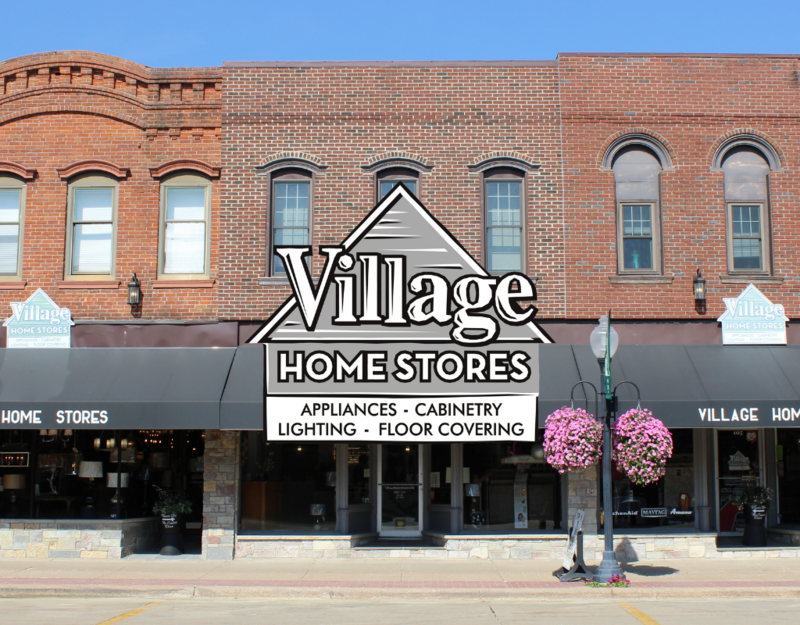 We hope that you have found this post because you a curious about Village Home Stores and want to know more about us. 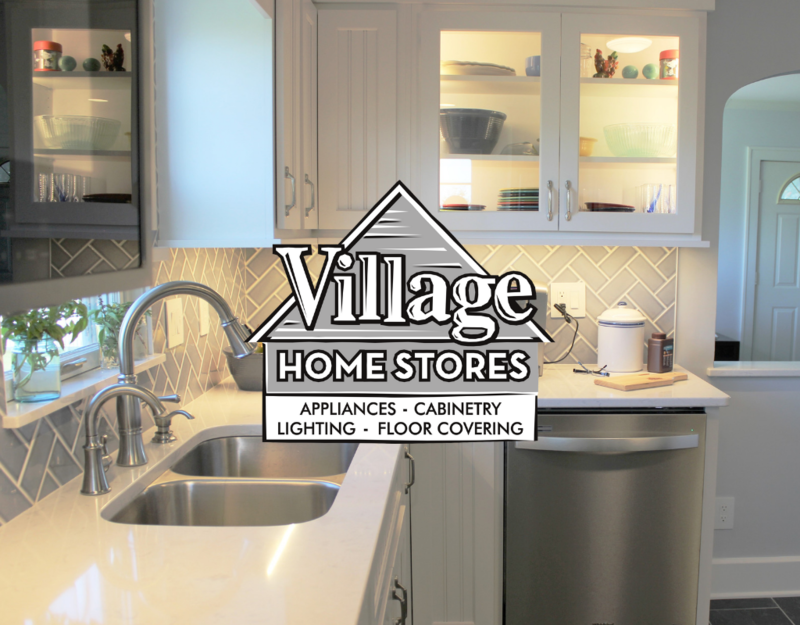 Village Home Stores is a small business located in a small town with a BIG mission to be your regional home store experts. That is why we have so many categories of products all under one roof for you to shop at 105 S State Street in historic downtown Geneseo, IL. We offer appliance sales and service, cabinetry and countertops, lighting, flooring, wall tile, and custom window treatments for remodel and new home customers. Having our store located in a strong, growing small town community allows us to provide our clients with over 10,000 sq. ft. of showroom as a destination. 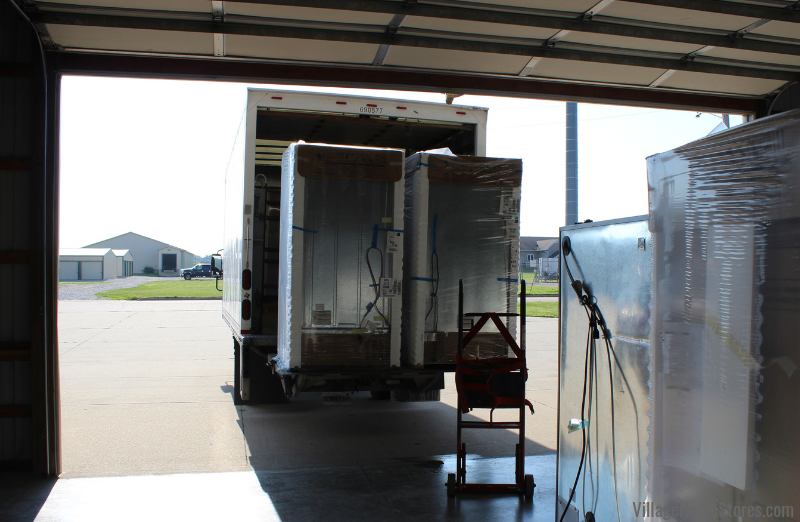 We service a large radius surrounding Geneseo including the entire extended Quad Cities region. 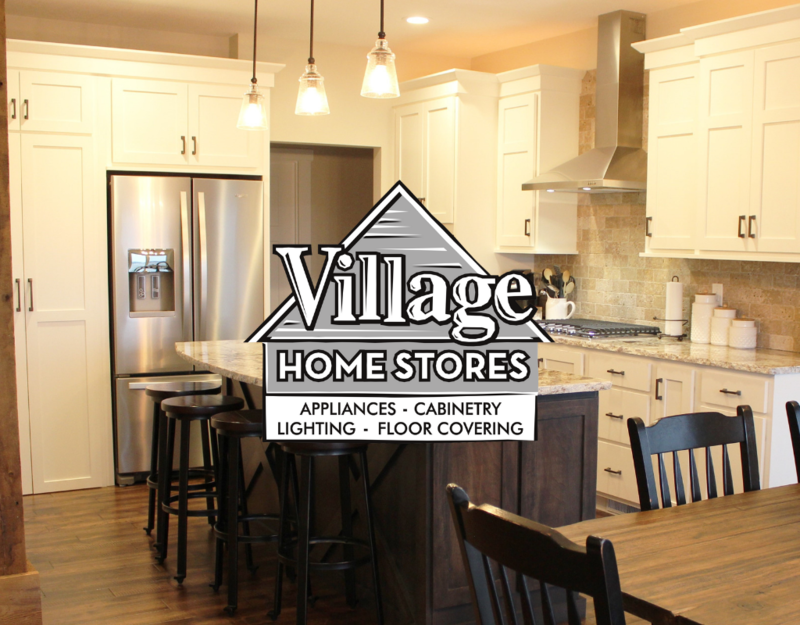 Since our founding in 1984, Village Home Stores consistently strives to improve the customer experience while offering quality products at a reasonable price. We offer a one-stop-shop approach and can build an expert team for your project no matter the scale or budget. 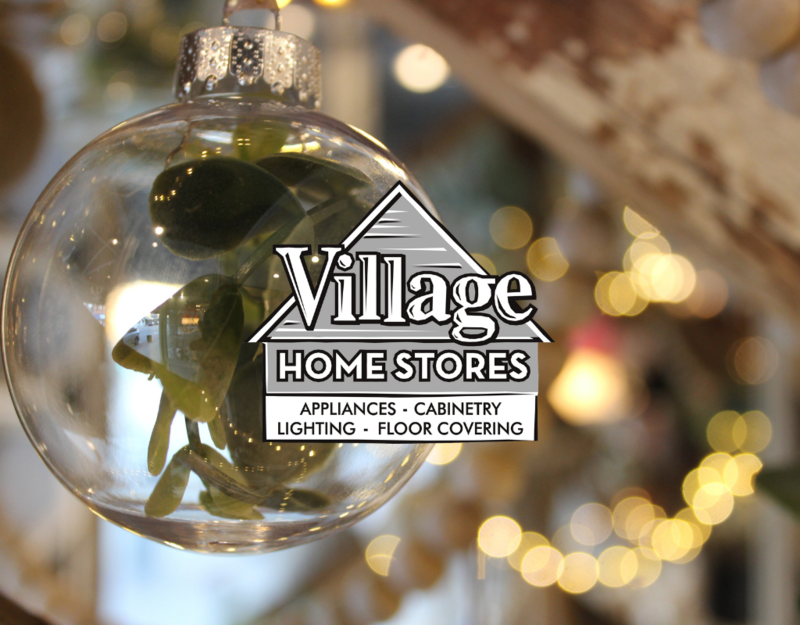 Curious about what you can expect when shopping at or working with Village Home Stores? Press play below to meet our owners and learn more about who we are. We want to thank BrandSource for providing us with such a great way to tell our story! They created this video for us in August of 2018 when we were named the 2018 BrandSource Dealer of the Year at the National Convention & Expo in Las Vegas, Nevada. Our co-owners Rob Ries and Jim Ries were on hand to receive the honor at the awards ceremony. The BrandSource Dealer of the Year award is presented annually to a member who has shown continued support of BrandSource and its direct suppliers. 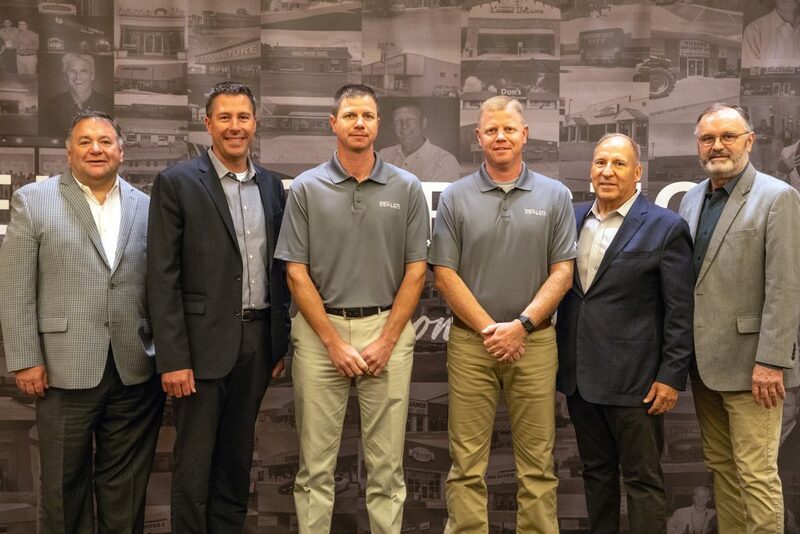 Co-owners of Village Home Stores, Jim Ries (centered left) and Rob Ries (centered right) were named a 2018 Dealer of the Year at the BrandSource National Conference held in August. Photo provided by AVBmarketing. If you are familiar with our weekly TV show, or this store blog, then you know we love telling stories about the projects we have completed for our customers. It is a bit awkward sharing our own story, but we think it is important for us to get information out there about our store so that we can help as many people as possible with the expert team and services we have assembled over the years. Our growing staff currently has 35 employees. This includes designers, inside and outside salespeople, project managers and estimators, service technicians, delivery and installation technicians and more. 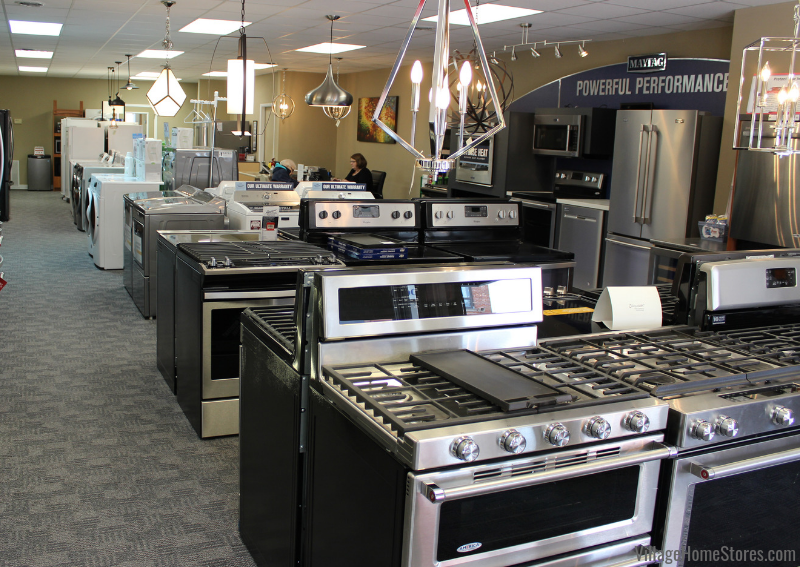 Our appliance showroom has a full staff of expert appliance service technicians and can service all major appliance brands including ones we don’t sell. We don’t just end the conversation once we get your purchase. It is important to us that we do not sub contract out our product deliveries because we want to be your expert team from start to finish. By choosing to support our small business, you are supporting our 35 employees so thank you! That support is why we are not only still here, but growing! Every department we have added to the store is by the request of our customers who hoped to get the same experience they have come to expect from Village. Therefore, we believe our customers deserve an award-winning experience in an award-winning showroom. We want to make your building or remodeling process as easy and enjoyable as possible. We know for many of our customers, we are a destination. Our goal is to exceed your expectations and be worth your trip. We value your time and hope that you will find our showroom setup and process a way to save you time and money. Another way of thanking you for your business is by assuring you that we are doing all that we can to provide you with the fairest prices possible for the quality products and services we are providing you. That is why we offer a Local Low Price Guarantee. Our customers find that our everyday low prices are comparable to all of our competitors plus they receive a great customer experience when working with our staff. We buy from a very large buying group to allow us to offer quality products at the same prices as larger stores. If we find that someone has offered you a better price for the same products and services, we will match that local price. “After so many years in business, many of our customers have come back to buy from us again because they know they are going to be taken care of, ” says Rob Ries, co-owner of Village Home Stores. The goal of our staff is to stay expertly trained and to listen to your needs and best match your needs to the right products for you and your budget. Plus you get the personal one-on-one treatment your investment deserves. You can rely on us to match you with the right product and help you learn the features that best suit your lifestyle. We curate a team of experts for your project based on your needs. That team, all under one roof, can openly communicate about your project to keep you on track and on budget. Having multiple department experts aware of your overall project vision and goal allows them to work for you to confirm details on your selections. 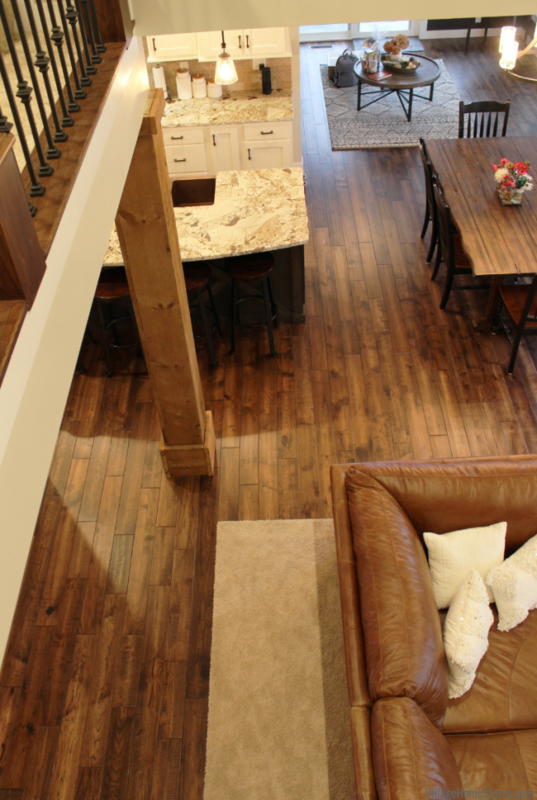 That gives our customers a piece of mind that their overall finished project is always the team’s vision. Winning the title of Dealer of the Year comes just behind a handful of other 2018 awards that we would have never dreamed of receiving! 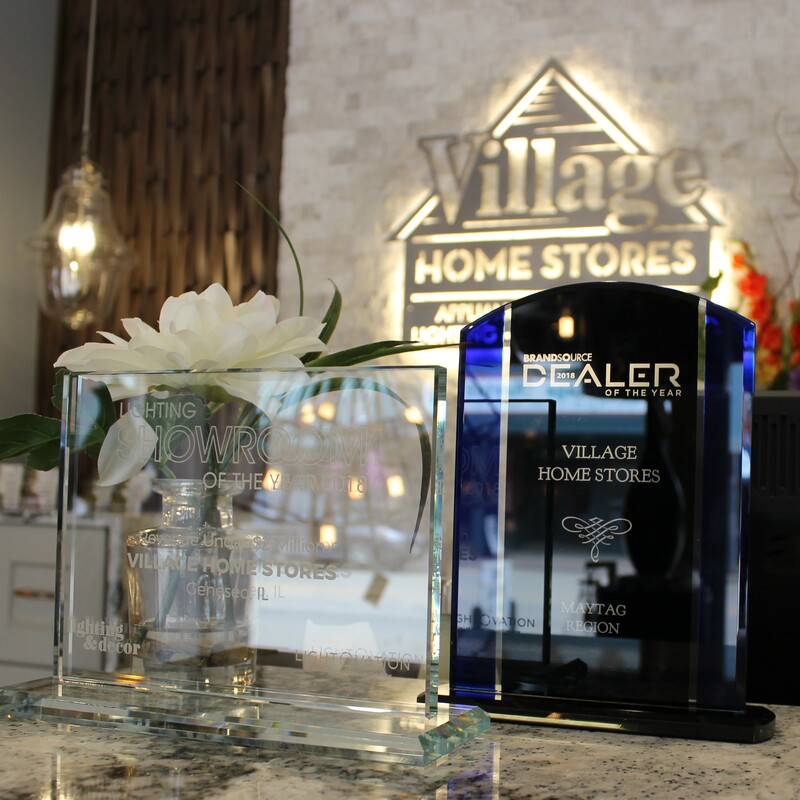 The bottom line is, Village Home Stores would be no place without the years of support our customers have shown us. Support in the form of trusting us to help make their homes more functional and beautiful. Inviting us into your home is a big deal! We don’t take that for granted. Thank you for your continued support and we hope if you haven’t yet worked with us, you will give us the opportunity to meet you and gain that trust. From DIY cash and carry customers, to complete start to finish remodels, we want to help. We want to be your one stop shop and we can’t wait to hear what you are working on! 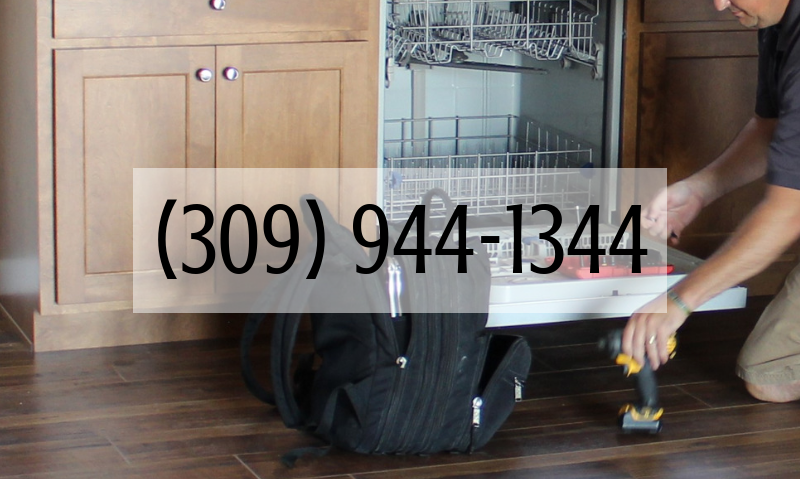 We offer appliance sales and service, cabinetry and countertops, lighting, flooring, wall tile, and custom window treatments for both remodel and new home customers. If you have questions about any of these categories of product, just click on them in this paragraph and you will hop right over to our website. Want to start the conversation about your own project and not sure where to begin? We have a process for your project no matter how much help or product you need. Every first step to our process begins at the same place, just reach out to us. 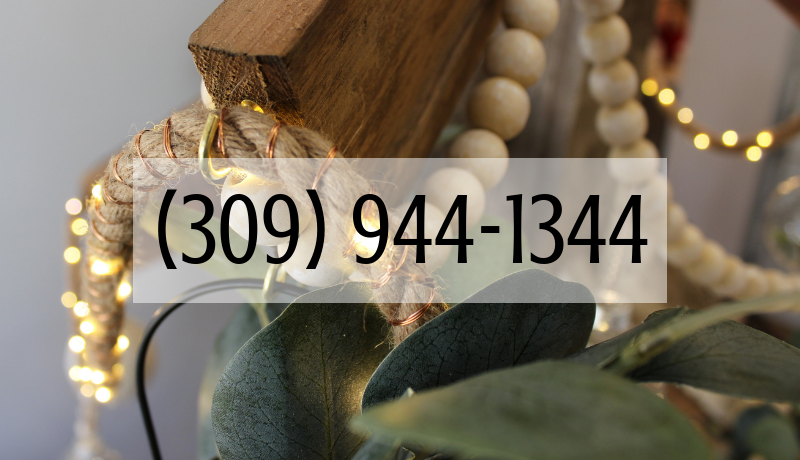 Contact us for an appointment by calling our phone number at 309 944 1344 or by completing this short online form. Geneseo, IL- Historic Home Remodeled and Updated With Nods to History. When you remodel a home you are writing a part of its history. Every renovation, small or large, becomes an entry into the timeline of that property. Many times our client’s personal style choices drive the selections and design decisions entirely. In a historic home the home itself also influences decisions. When our expert kitchen remodeling team takes on a project in a Historical property, we are so honored to become a part of that history. True of many older homes, there are doorways and unique wall spaces to consider when laying out the new design. The completed new layout now includes a back wall with the cooking center, refrigerator wall with pantry area, single-level island with sink, and a new hutch area. The contrast from before to after below showcases that a shift in material selection alone can make any space seem brighter and larger. The new kitchen seems much larger than the original but no walls were removed. In fact we ADDED many cabinets to this kitchen. Including a new lighting plan and selecting brighter finishes help to make the space seem spacious and timeless. As you can see in the image below, the cabinetry now also extends all the way to the ceiling for a more customized and built-in look. A flat-panel white kitchen cabinet remains the most classic of choices for all tastes and styles. Here in a historic property it looks right at home. This kitchen includes cabinetry from our Koch Classic line in the Prairie Door and Shaker edge profile. The main kitchen cabinets are in the painted “White” finish by Koch. Because of other molding details in the home, a traditional crown molding profile was used where the cabinets meet the ceiling. A custom wood hood is installed above the range and the addition of a mantle area/shelf allows for decor to be added.Just beyond the main cooking center wall is an area of the kitchen that has been transformed completely. So long alcove with open shelves…. and hello gorgeous new built-in hutch! 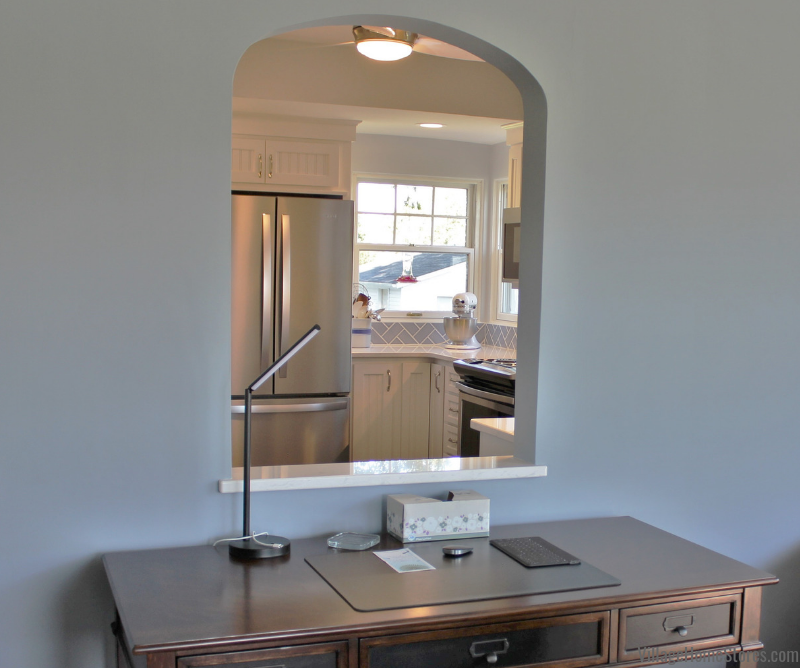 This little corner of the kitchen may be our favorite part of the new design. A combination of glass doors and open shelves, all illuminated by our Diode LED lighting system. This Diode system has been installed throughout the kitchen as undercabinet lighting. The same low-profile, low-voltage lighting is also installed in the glass-door and open shelf cabinets! We realize we sound like a broken record in every feature when we talk about this lighting but trust us it is a key player in why projects like these look so great! 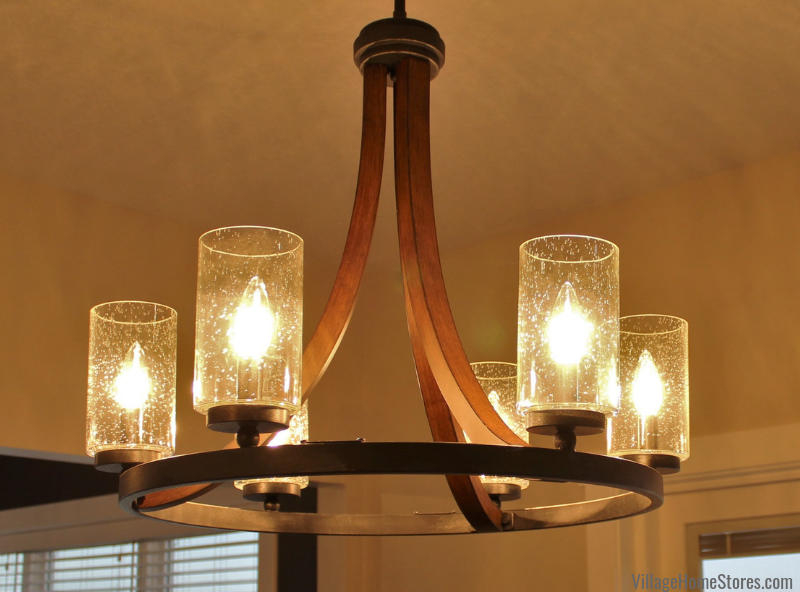 Including this lighting is such an important part of showcasing the investments you have made into your home. Once installed, the lighting becomes the perfect task or ambient light. 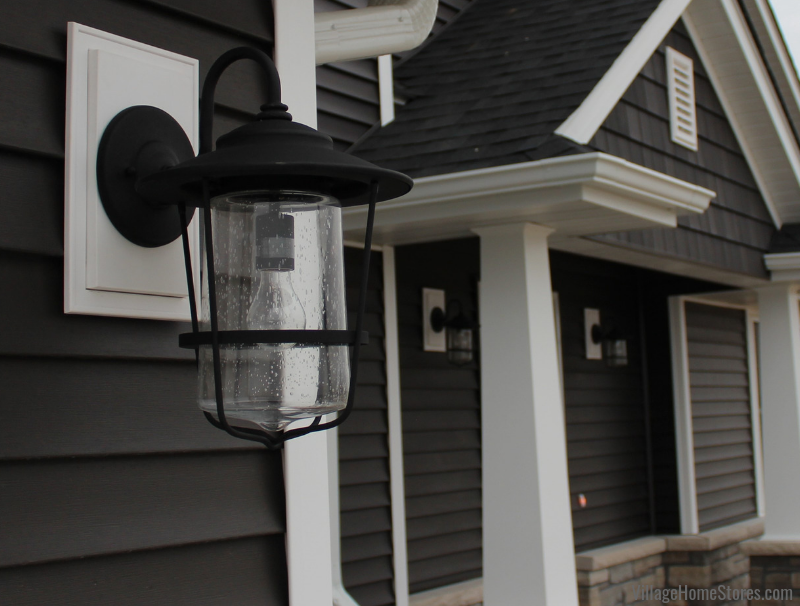 It uses very little energy and the look is great day or night. For instance, these images were taken during the day and the lighting STILL makes a big difference even with daylight coming in the windows. 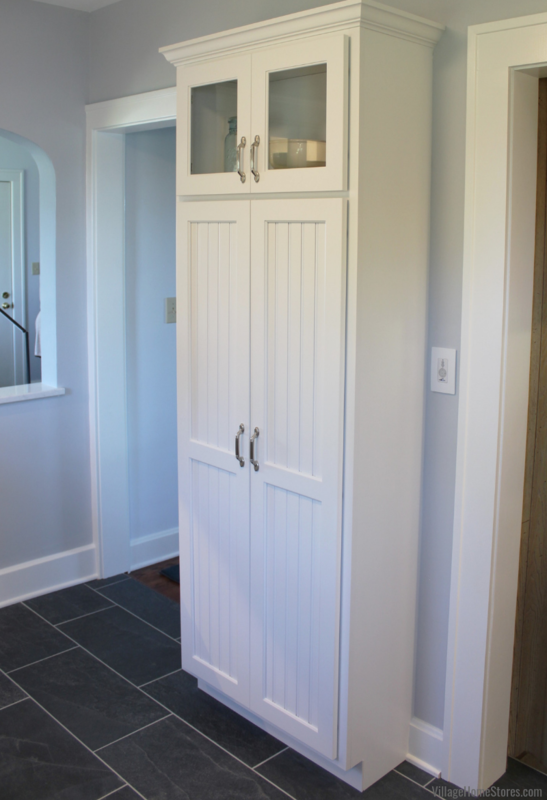 Another design detail that gives a historic look are the “clerestory” glass cabinet doors. The cabinets surrounding the hood have the top section cut for glass and become a great space for display without distracting from the hood itself. Of course classic white subway tile is always a great material for any historic home. Another nod to the history of the home is the use of moldings and decorative detail. This kitchen is a very bright and clean look. The look can be achieved and still include details like supports or corbels. Not all of these details are heavy carved or scrolled wooden elements. In this case, a subtle style of mantle bracket was selected that complements the cabinet doorstyle. 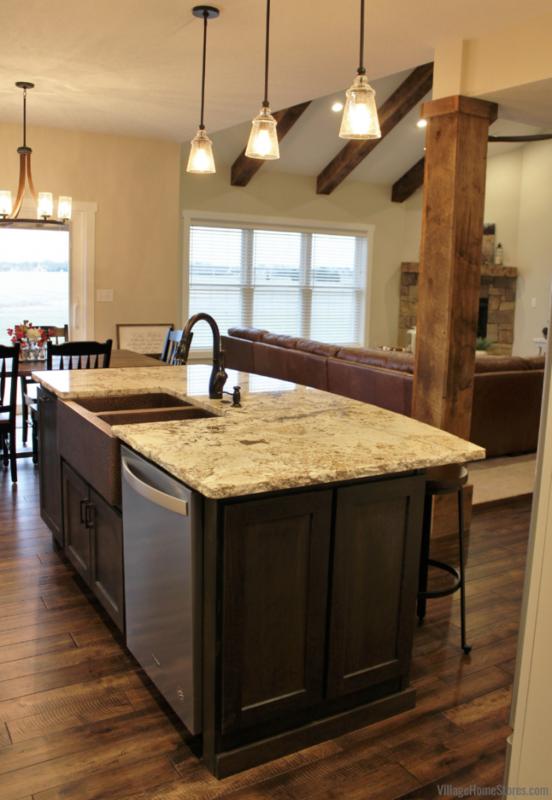 A large single-level island is in the center of the kitchen and is now home to the kitchen sink and dishwasher. There is a curved overhang area for seating on the back side. Modern upgrades and updates should always be considered when remodeling. Ask yourself what suits your lifestyle and could make your enjoyment of the space even better? An upgrade as simple as this garbage disposal button may be something your become thankful for daily. The low-profile of the button helps to keep it from being noticed unless you are really a user at the sink. The apron farmsink has found its way to be included in many styles of kitchen spaces within the past few years. Where it began it’s demand and influence is from projects just like this one. An old-world look inspired by large cast-iron farmsinks. We love the look of this Kohler Whitehaven sink. The Vicksburg Door with Shaker edge is installed in a Rustic Hickory wood and “Driftwood” finish. This soft gray stain looks great and allows the Hickory grain to be highlighted. The lighting above the kitchen island also helps to keep the kitchen feeling open and bright. 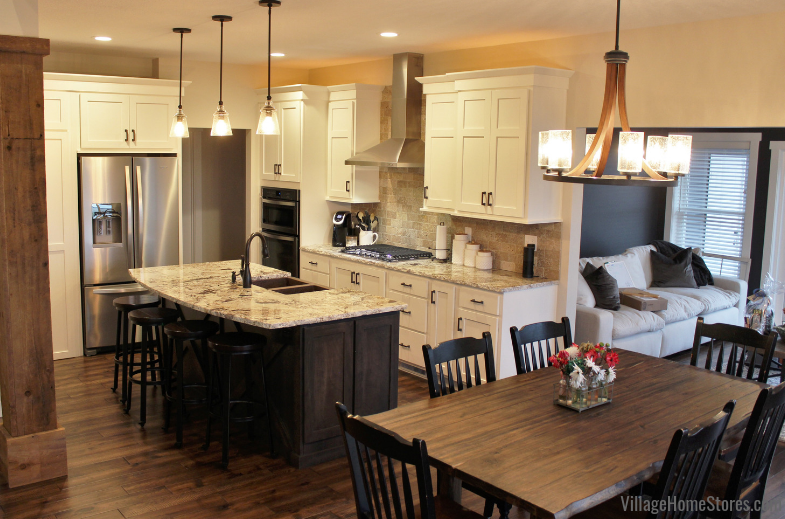 Two pendants hang above the island in a polished nickel finish. These Kichler lights are perfect. The finish of the lights allow light to bounce off of them and the open frame style of the lights allow your eye to look right through them. Polished chrome and nickel finishes blend very well with Stainless elements. 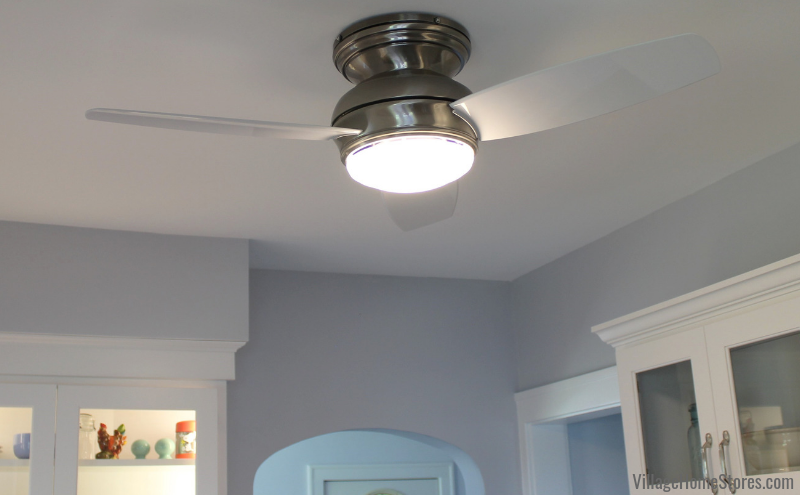 Using a brushed light fixture may have suggested a more modern style for the space. Of course many upgrades were brought in by replacing the appliances with a brand new KitchenAid suite with Sharp microwave drawer. The 36″ wide dual-fuel commercial style range is stunning in appearance and top-notch in features. 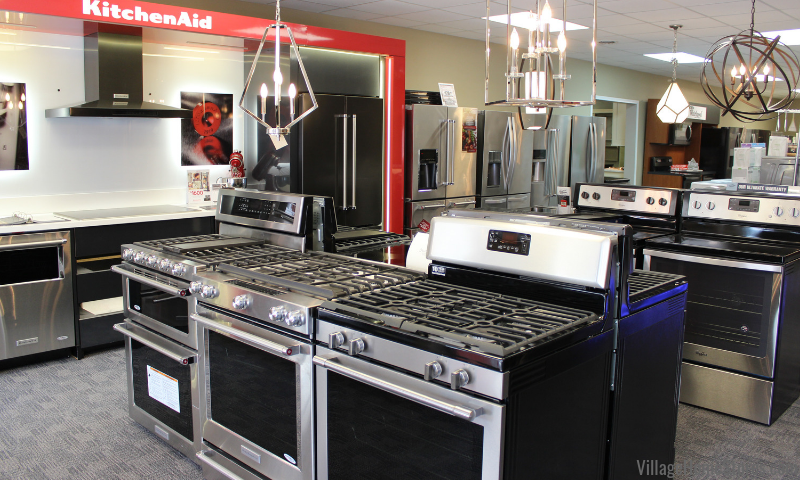 KitchenAid does a fantastic job of bringing professional-level features and benefits to you at a fraction of the price of other 36″ wide range options. Dual fuel gives you the precise control of a as cooktop with the consistent temperature control of an electric oven below. Microwave drawers can really be the unsung heroes in spaces like this. Could you imagine this same wall of cabinetry with a microwave hood? Even a countertop microwave would distract from the finished look. Microwave drawers give a clean look and a functional upgrade. 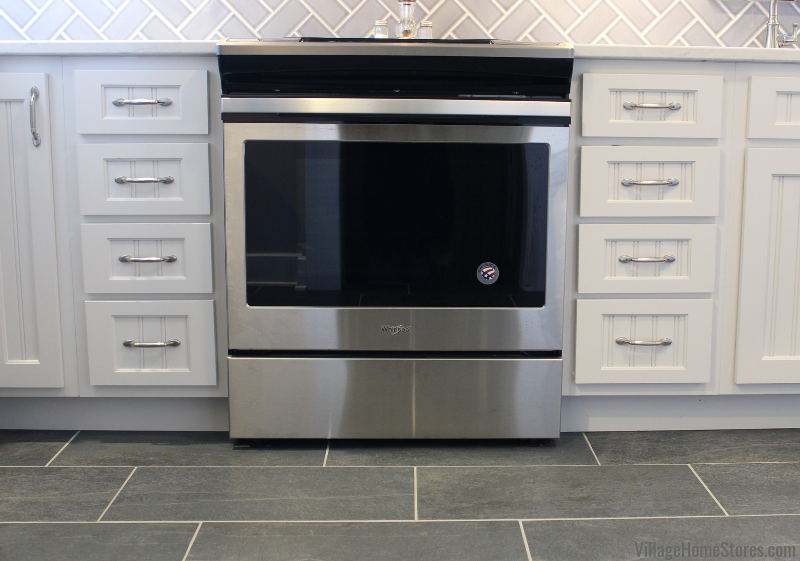 This 24″ wide flat-panel model blends really well with any Stainless Appliance suite. We managed this remodel from start to finish. Walking our clients through every step of our process to keep everything on track for time and budget. We hope to get so show you more of that full process in an episode of our TV show very soon. Until then you can see some great images from the whole process on our award-winning Houzz portfolio. See the full album of images from this project including many before and during photos here on our Houzz page. There you can save the ideas you love from this project into your own ideabooks or even write on and message your team at Village what you love about this product. 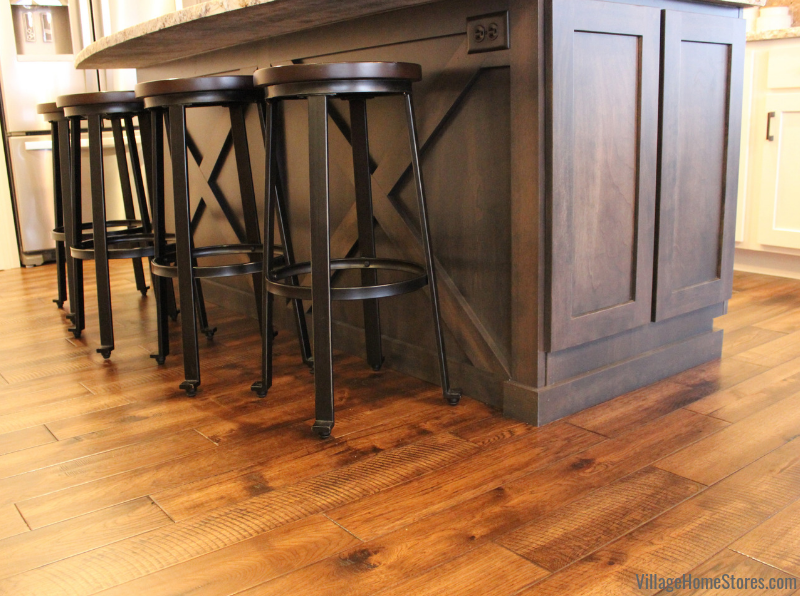 Don’t forget that we also carry floorcovering and tile at Village Home Stores! 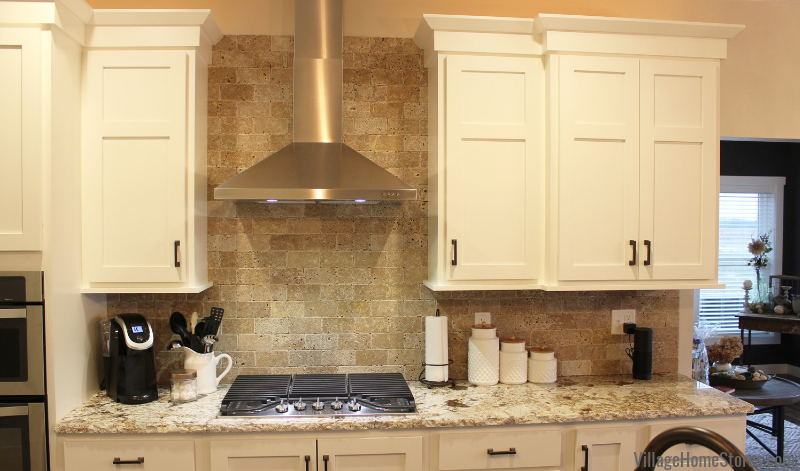 This kitchen includes a brick tile by Chicago Brick in the “Southside” color. 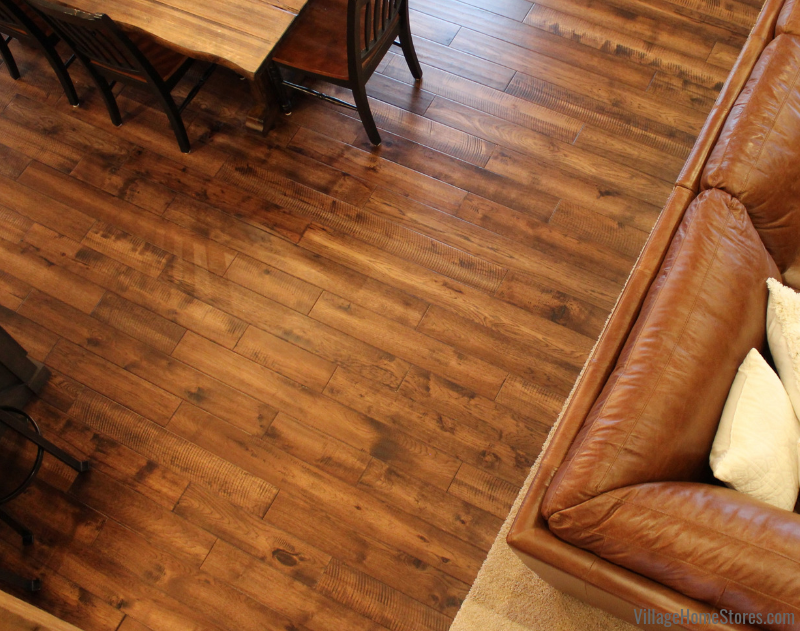 This tile gives the look of an old brick floor but is durable and easy to clean. We have this same tile installed in our Geneseo showroom so do stop out to see it in person. Do you own a property that is in need of an expert remodel team that will respect your home, your budget and your own ideas? 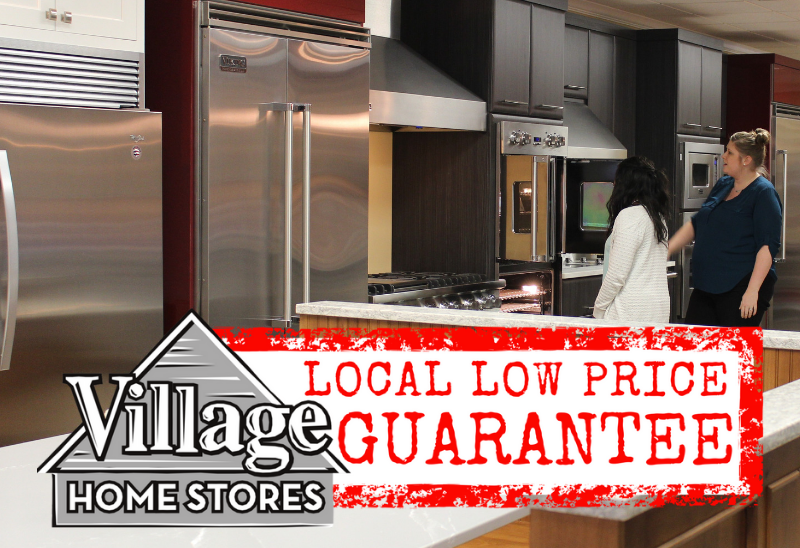 Village Home Stores is the right choice for you. Have your own crew or contractor to use? No problem at all! We can provide an expert design and material selection for you and your contractor. Want us to handle it all but don’t know where to start? No problem at all! Your first step is to reach out to us for an appointment. We will walk you through our process and answer any questions you may have. 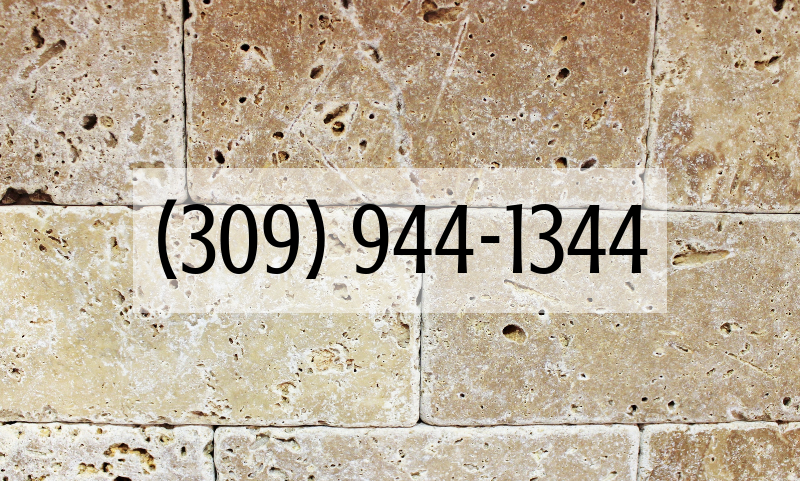 Call us at (309) 944-1344 or complete this short contact form and a member of our team will be in touch. We can’t wait to see what you are working on!